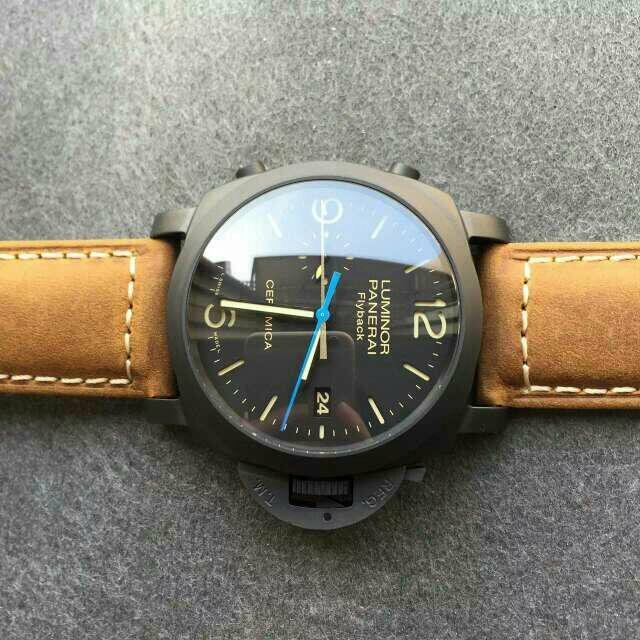 In our market, one factory manufactured a lot of brand wall clock three or four years ago, there are wall clocks of IWC, Panerai, Rolex, etc. 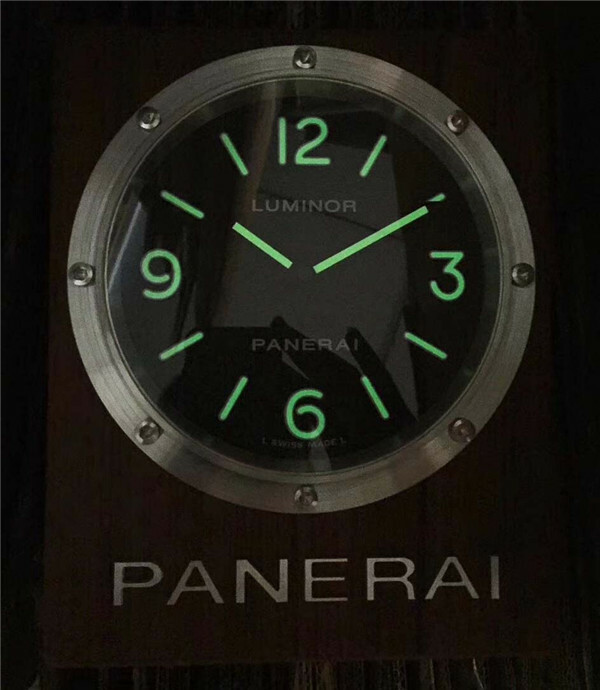 Among these brands, Panerai wall clock is the best-selling one. 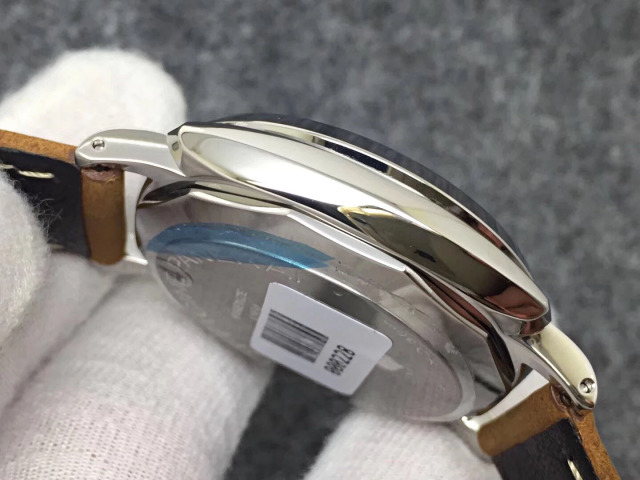 After a long time of stockout, now it is produced again and the factory improved it to make the wall clock to be 100% the same as genuine. 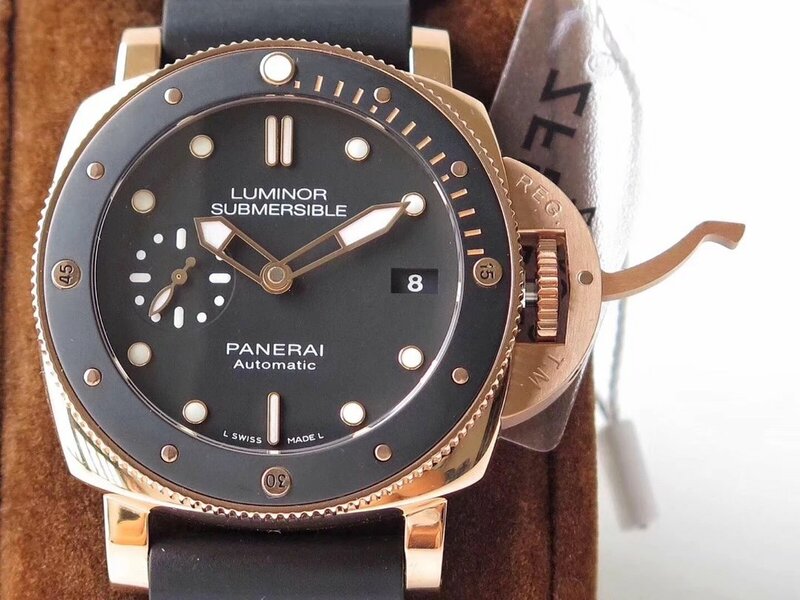 The base frame of Panerai PAM 255 is made of teak wood, which is measured to be 20cm in width, 25cm in height and 28mm in thickness. 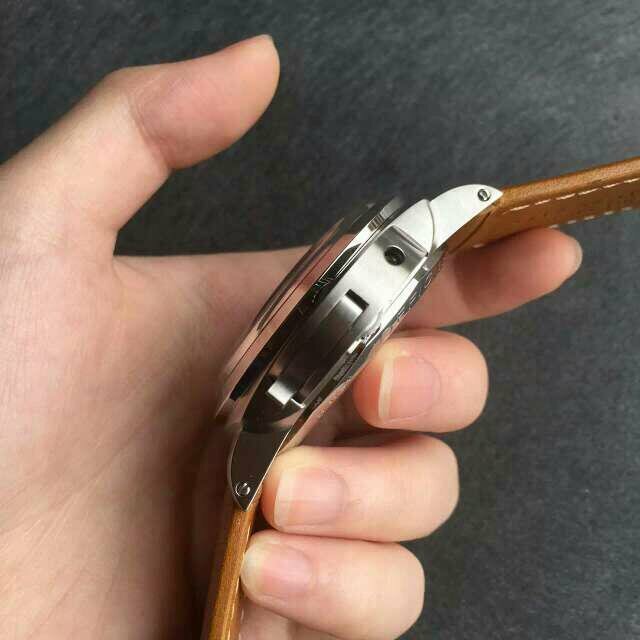 The central round case is made of 316L stainless steel, there are metal studs to fix the steel case to the wooden frame. 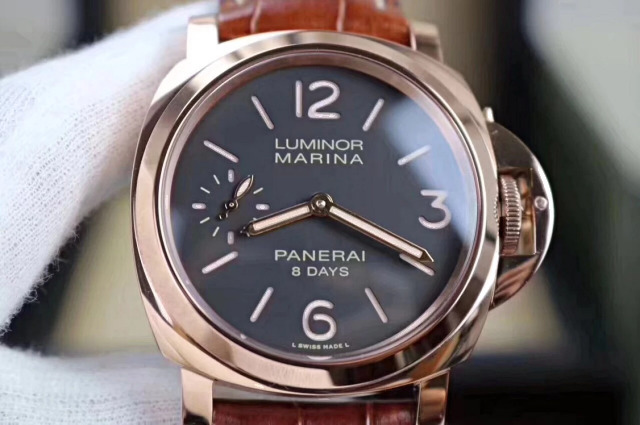 Big word ‘PANERAI’ is under the big dial. 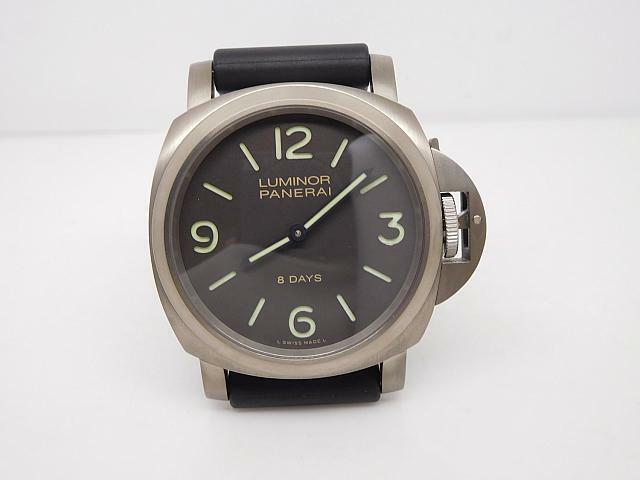 On black dial, it is a classic Panerai Luminor dial. 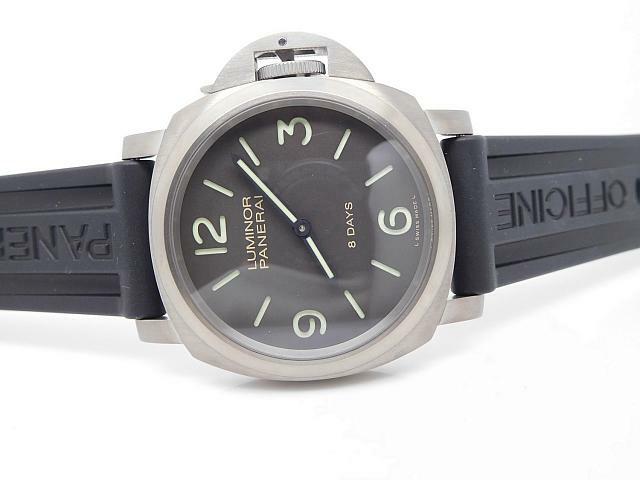 3-6-9-12 arabic numbers are big for you to read the time from the dial. 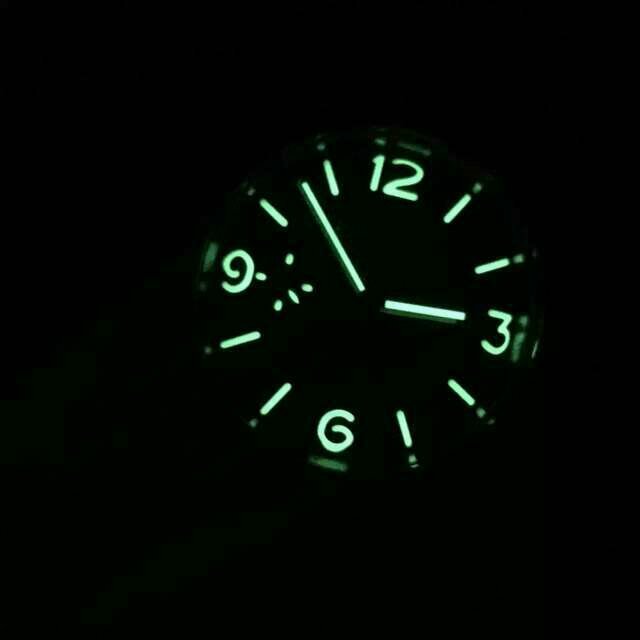 Check the dial lume photo, it is green and looks very strong. 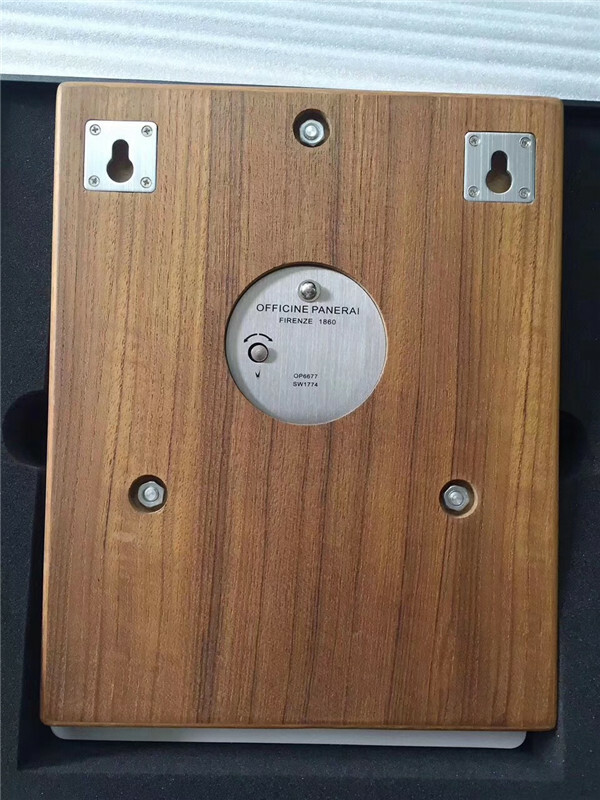 The back of the wall clock has two sockets on top for you to hang PAM 255 on the wall. 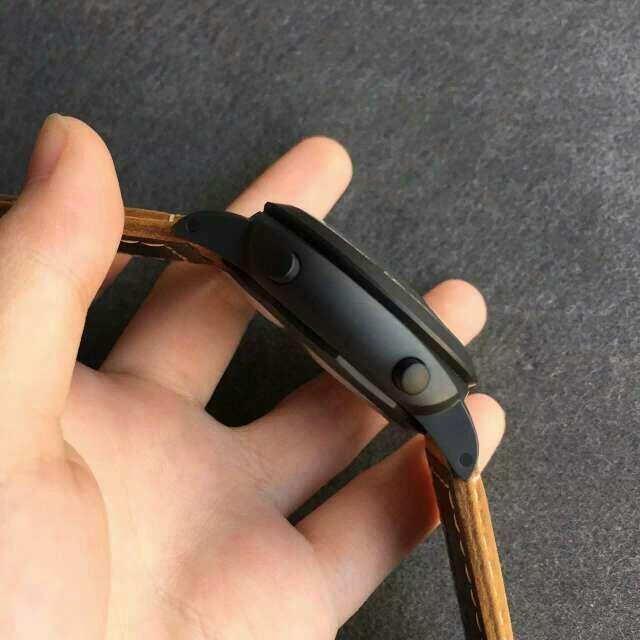 There is a round window opened on this wooden back, check the button, follow the direction notice to open it to change the battery. 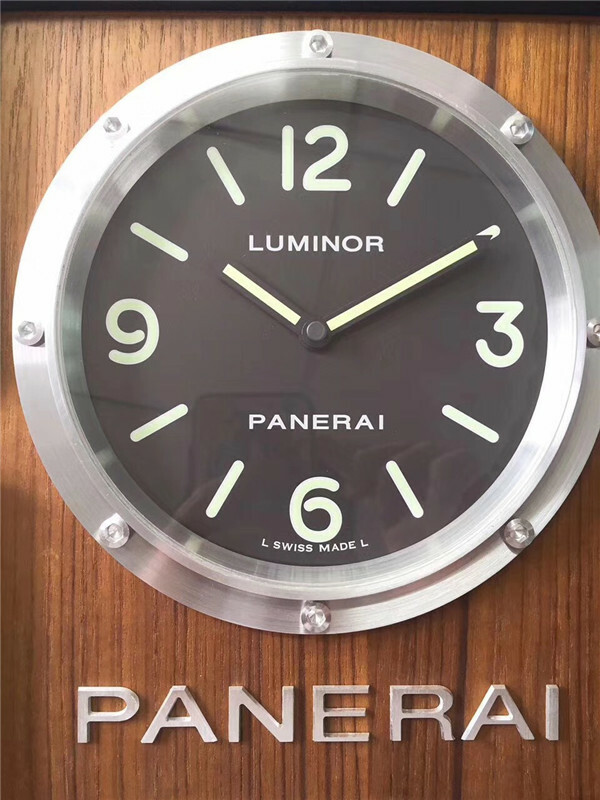 This wall clock is driven by a Swiss quartz movement, yes, you need a quartz battery to make it work. 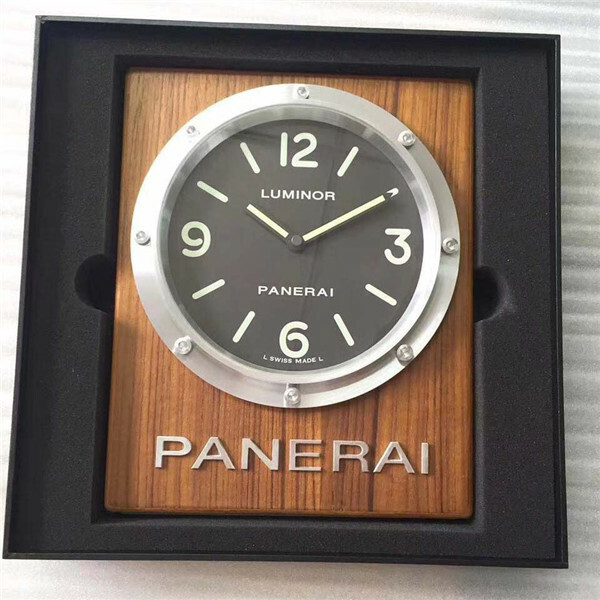 PAM 255 wall clock will come with an original box, and absolutely along with the book and warranty card. 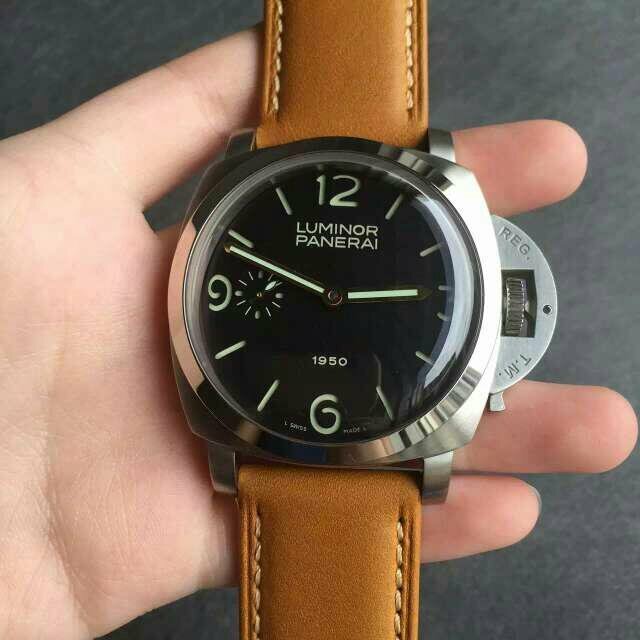 When I saw this PAM for the first time, it reminds me of PAM 360, two watches are famous models in Panerai world. 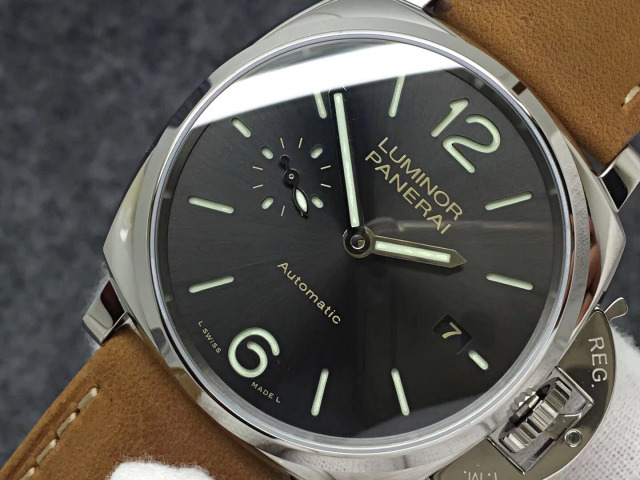 In my experience in replica watch world for several years, the manual winding models are not popular as automatic PAMs, certainly except PAM 005 and 111, which are made by Noob factory and got a great success, they are the watches that are replicated to be closest to genuine. 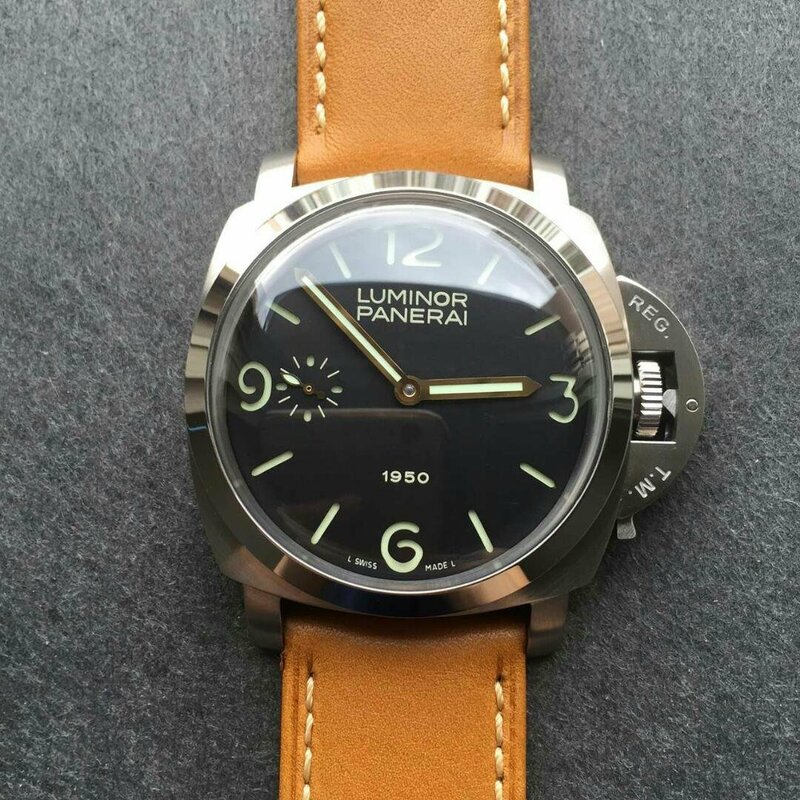 PAM 786 is a destro model, which means left handed. 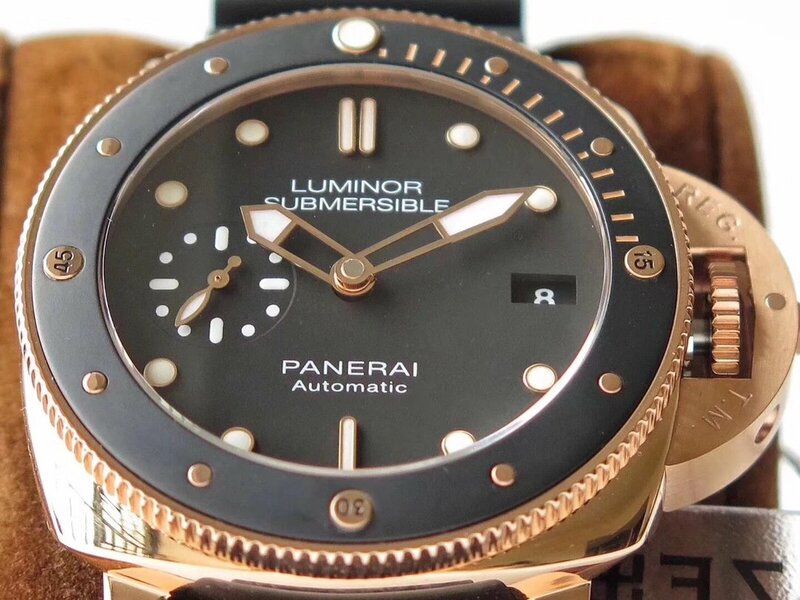 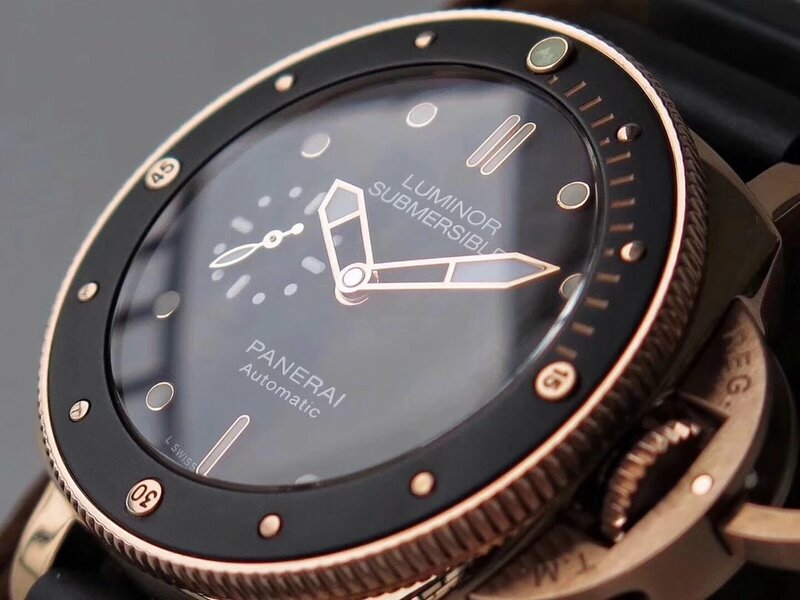 You have to admit the Luminor case of Panerai is very classic, not only meets current big watch size trend, but also has a perfect water resistance performance. 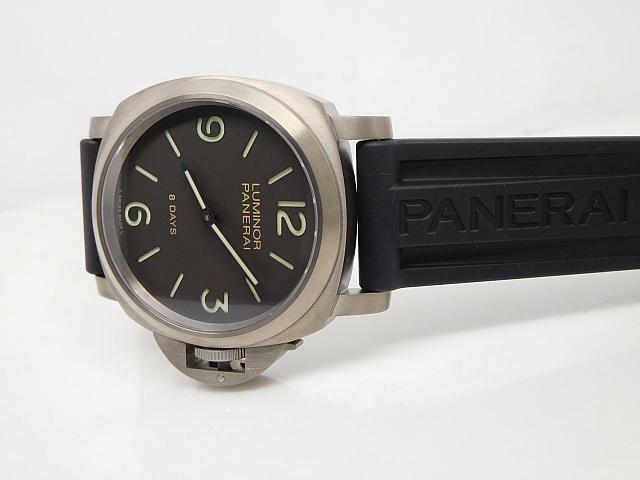 Like PAM 111, PAM 786 is also a very simple Panerai watch. 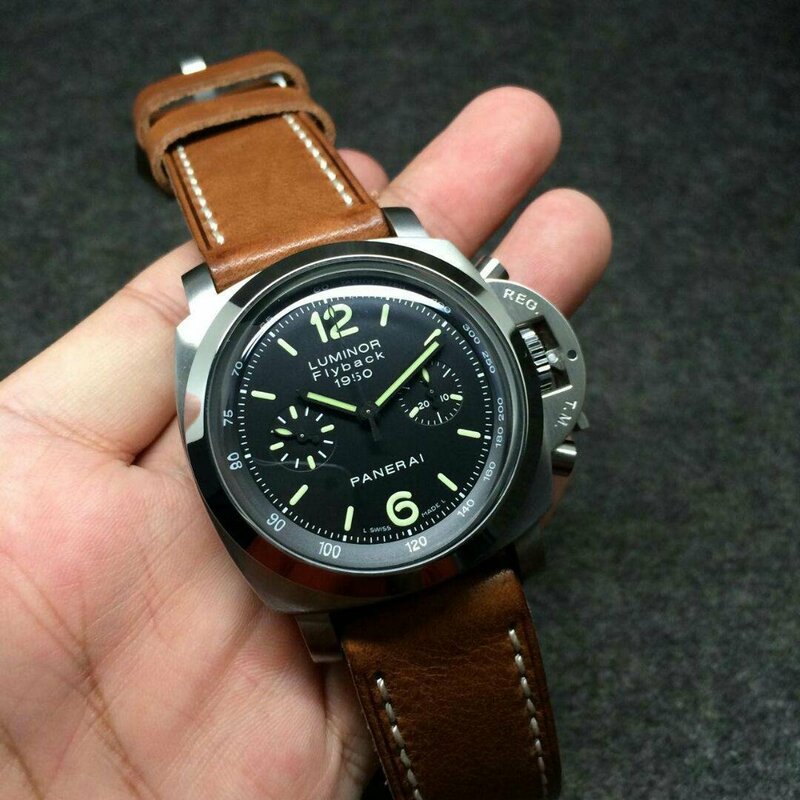 This is the first time for V6 factory to replicate PAM 786, so this is the first version, I do not know if they will improve it and produce a better one, but this watch has already been one perfect 1:1 replica. 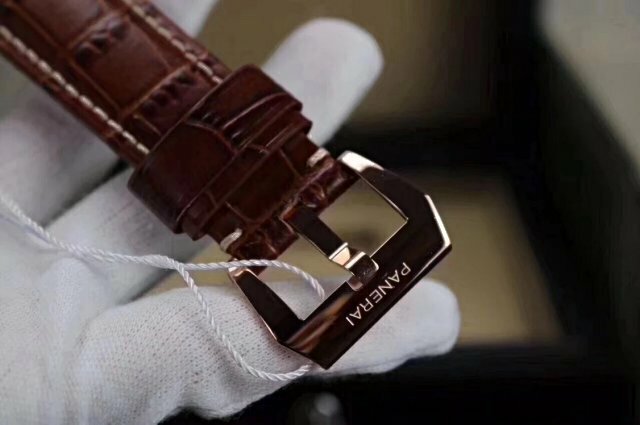 This has also proven one truth that more simple the watch is, easier for the factory to manufacture one high quality replica. 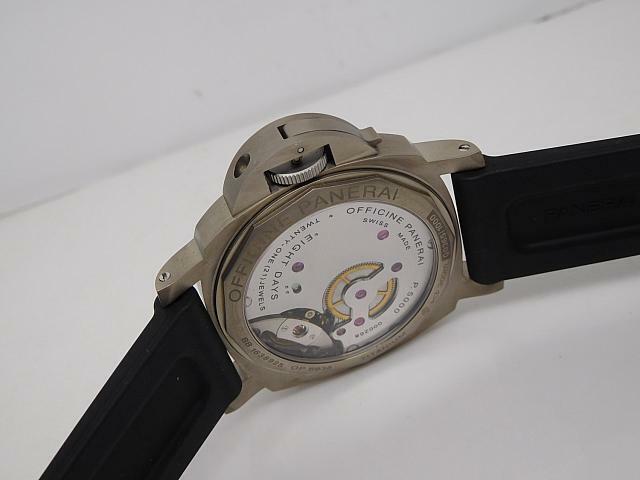 The case is measured to be 44mm in diameter, 15mm thick. 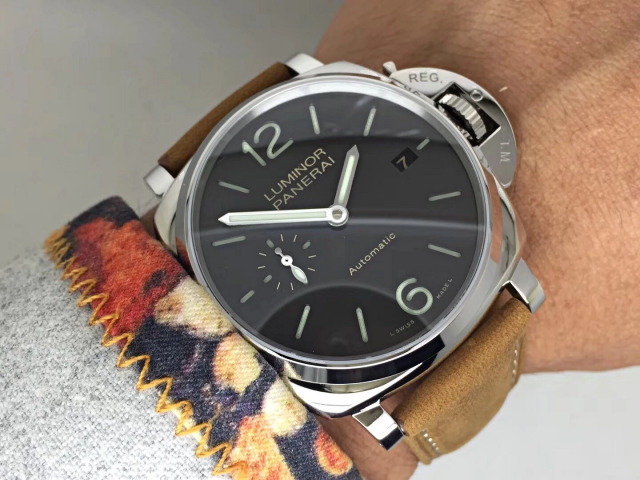 The black case is not made with ceramic, but solid 316L stainless steel with DLC coating. 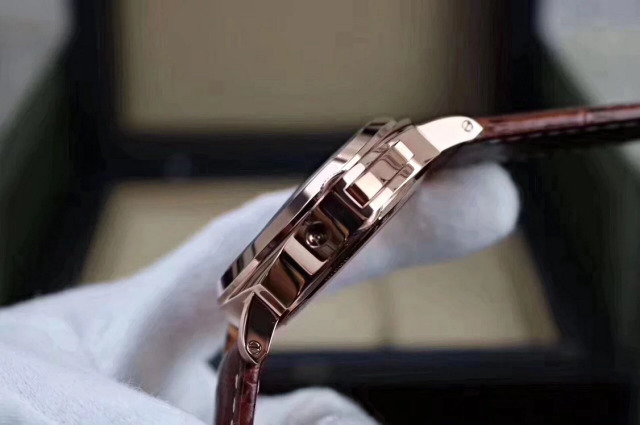 The iconic crown bridge is positioned on left case at 9 o’clock, case is brushed evenly and lugs have perfect arc so that the whole watch can fit your wrist in a comfortable way. 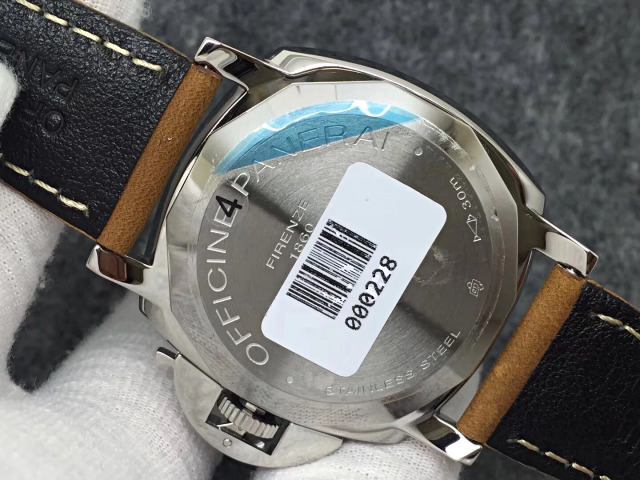 Solid case back is made of 316L stainless steel, there is a big OP Logo engraving on the center of the back, like genuine PAM 786, the replica has OP reference and other information engraved on the back correctly. 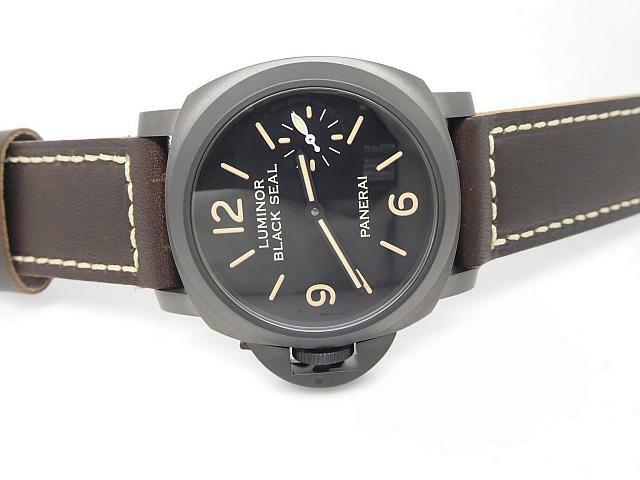 On black dial, there are no complex elements or decorations, just sandwiched structure with simple things. 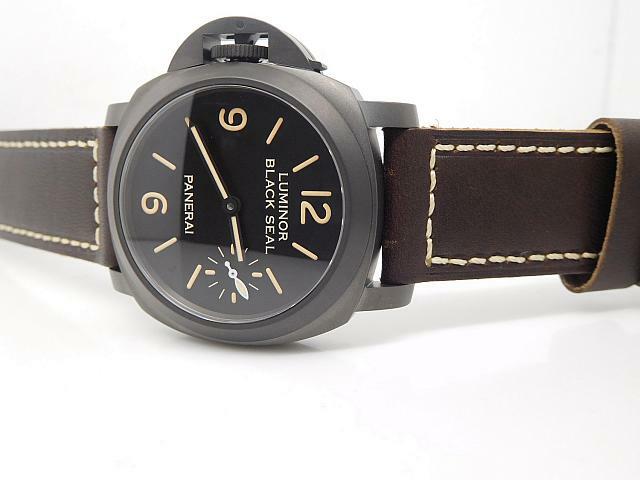 “PANERAI” lettering in white and “LUMINOR BLACK SEAL” under big 12 marker. 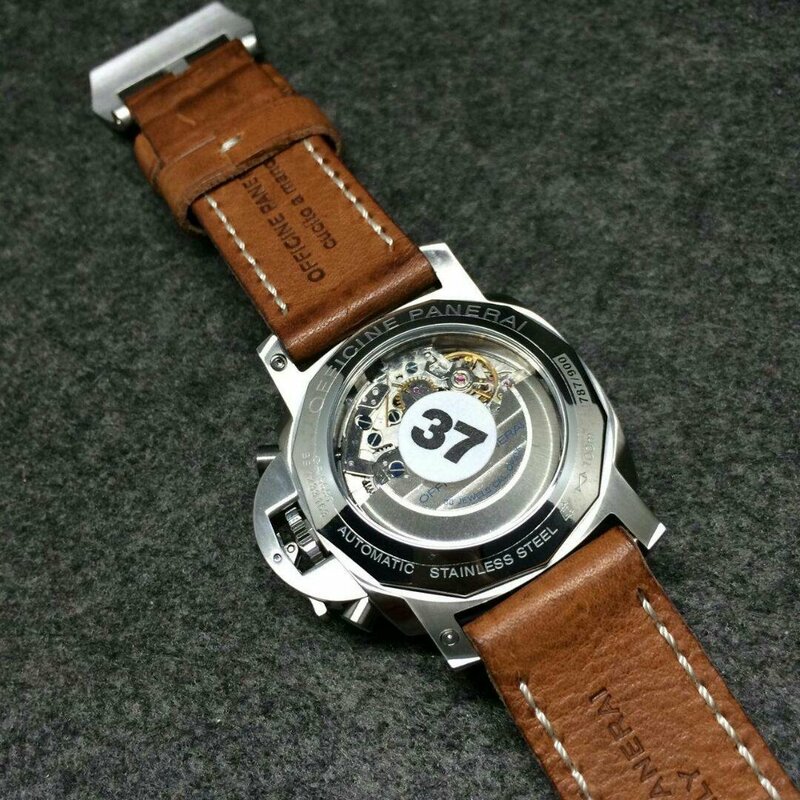 The disc on bottom is filled with white luminour material, the disc above has skeletonized hour markers so that the luminescence can display through the disc above. 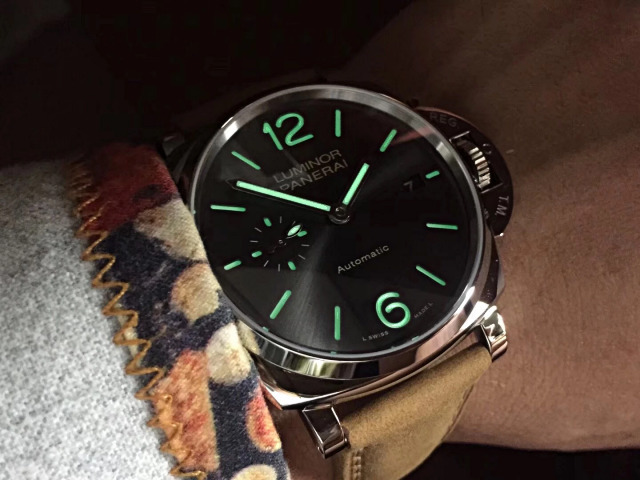 All hour markers and hands will emit strong green light. 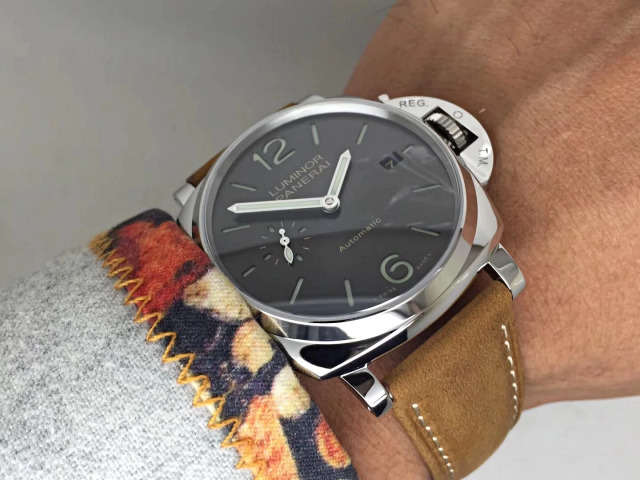 By the way, the leaf-shaped small second hand is running on subdial at 3 o’clock. 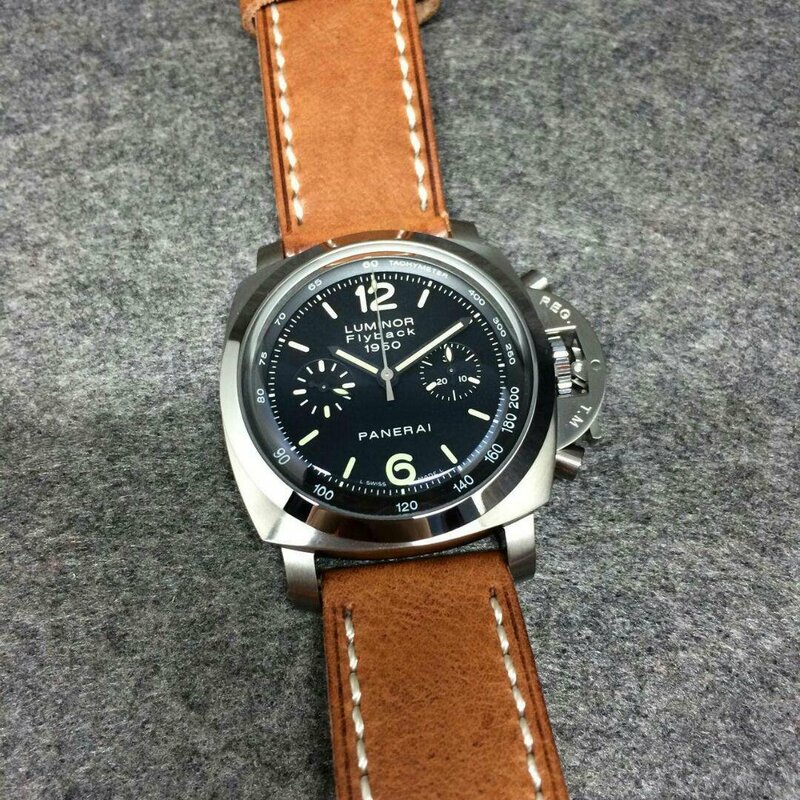 I like the brown leather strap, exactly its old feeling makes me love the replica PAM 786 watch more. 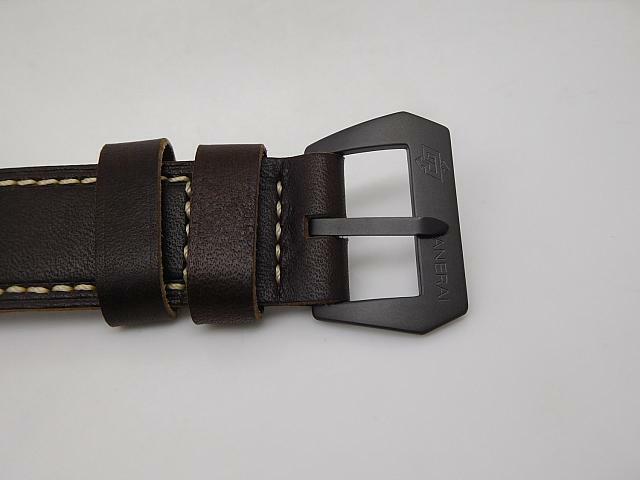 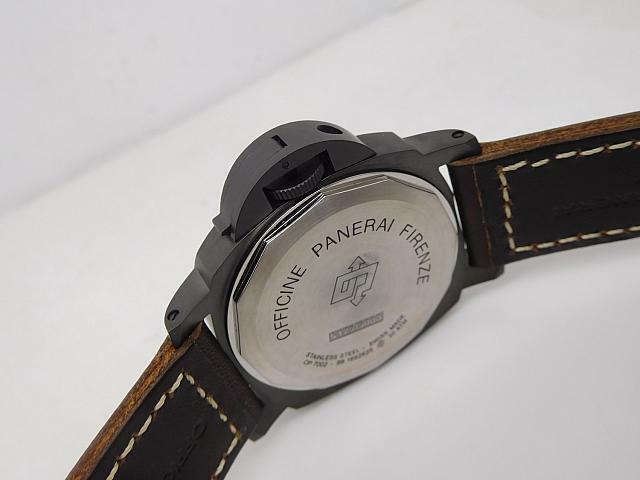 The strap is equipped with a Pre-V buckle, which has DLC coating and engraved with “PANERAI” and OP Logo. 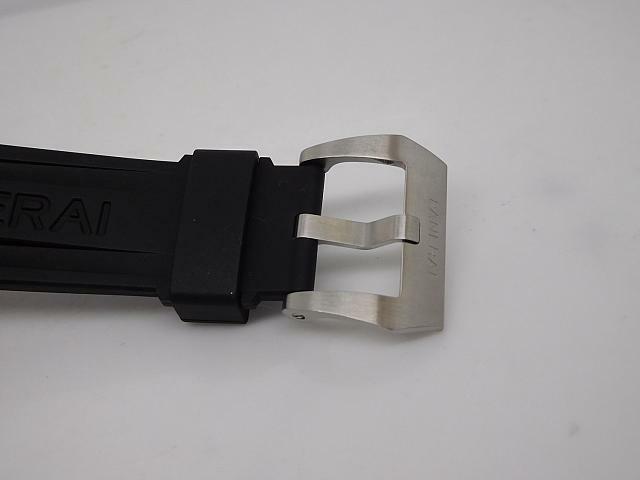 Please see the pin buckle, it looks very elegant. 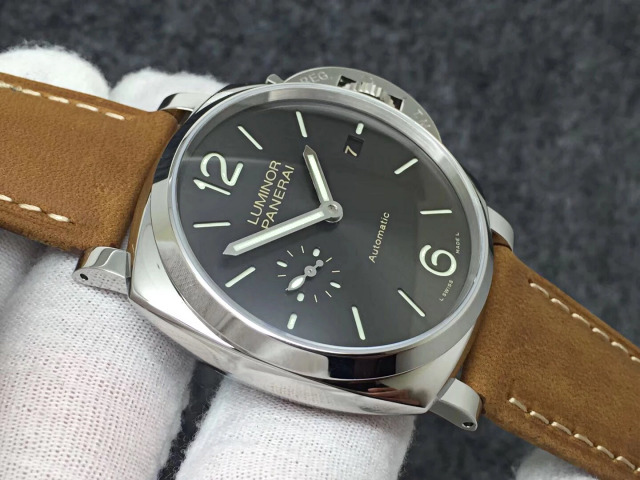 It is too hot now, and I have been working in a watch factory in Guangzhou for years, from a noob to an expert in replica watch field, I know the real trusted source to buy good quality watches. 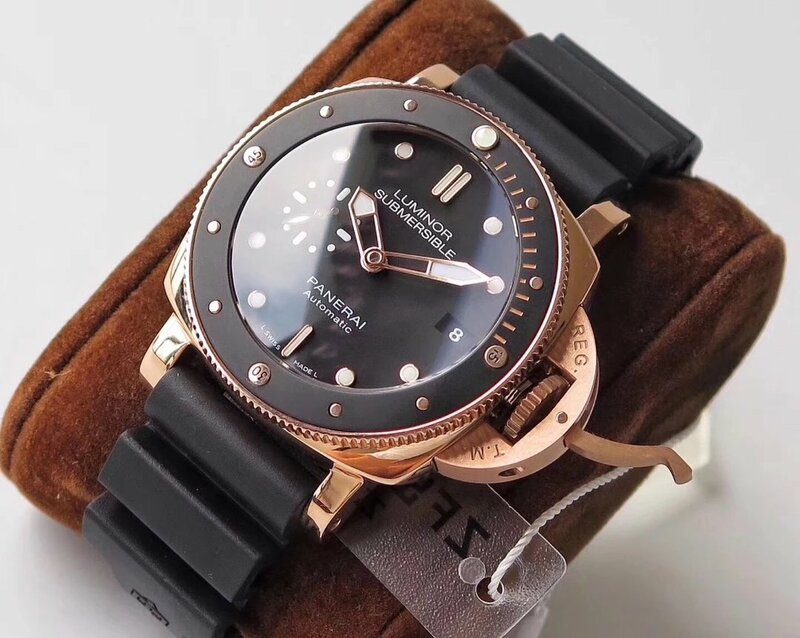 You have to admit those cheap and fashion watch replicas are most sought after, too many people who came to Guangzhou thought there are no replicas that are made to be 99% the same as genuine. 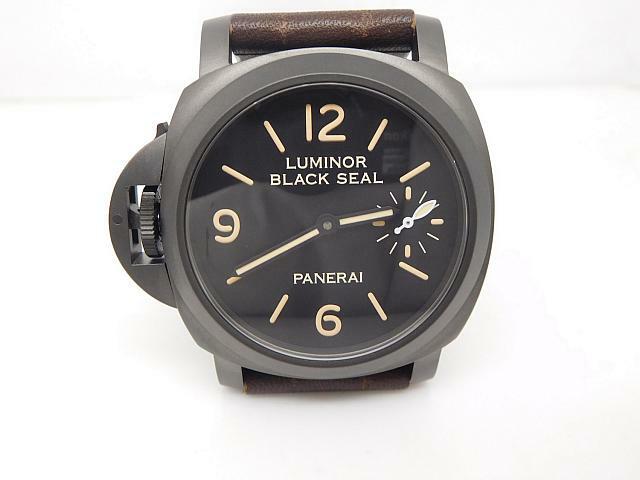 However, they are completely wrong, maybe they only walked into several watch stores on the roadside and picked pieces of cheap quartz watches. 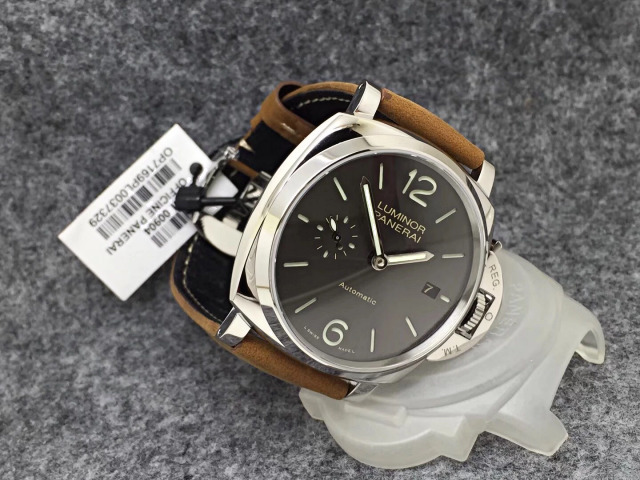 I must tell you there are good replica watches hidden in the office of tall buildings nearby, not every one knows this truth, you must find the right person who is willing to take you to the office of some famous factories such as Noob, BP, J12 and KW, otherwise you can not get the best replica watches. 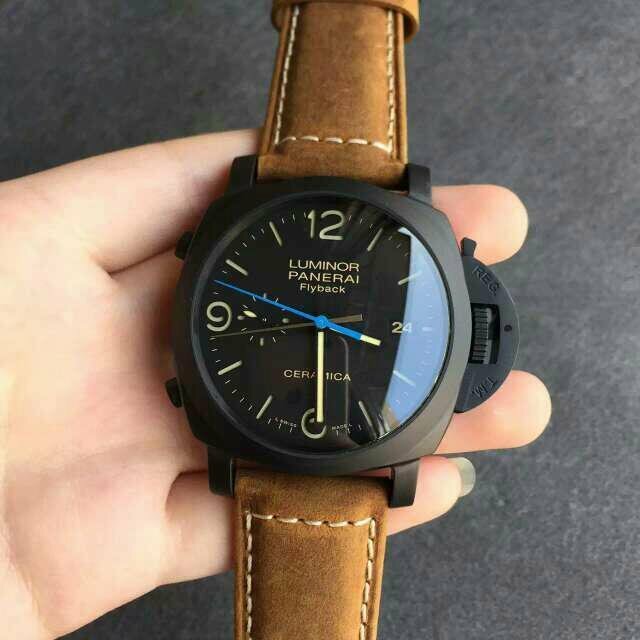 The main reason I created wrist watch spot is to offer you guys the most convenience and direct channel to get the highest quality replica watches, so just choose the reviewed replica watch you are interested, then send me a message and I will get you the best one. 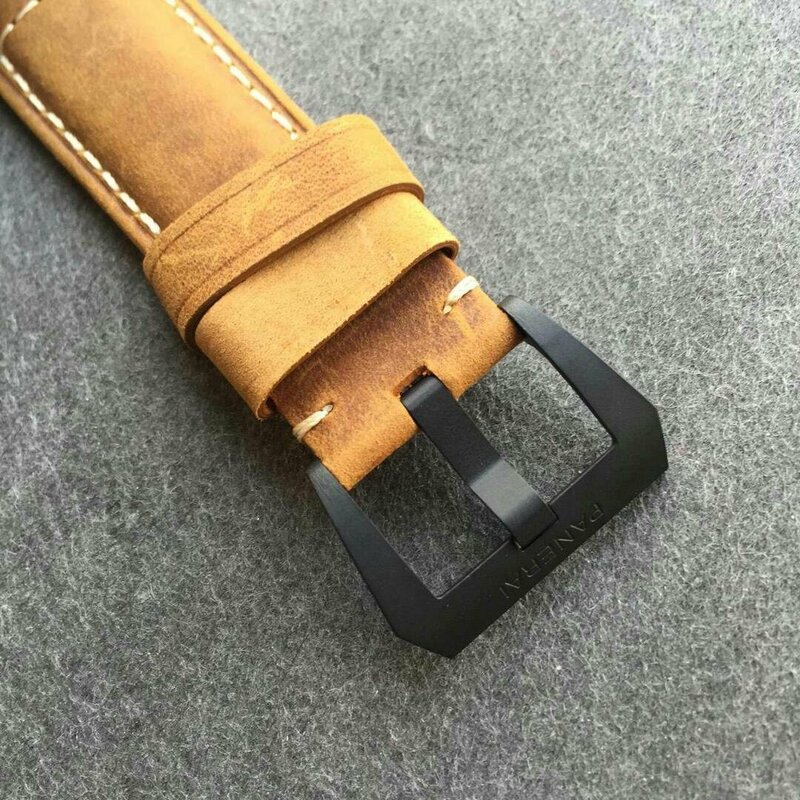 Today, I was just back from factory and now at home, so I have time to write a review on another good replica just made by Noob factory. 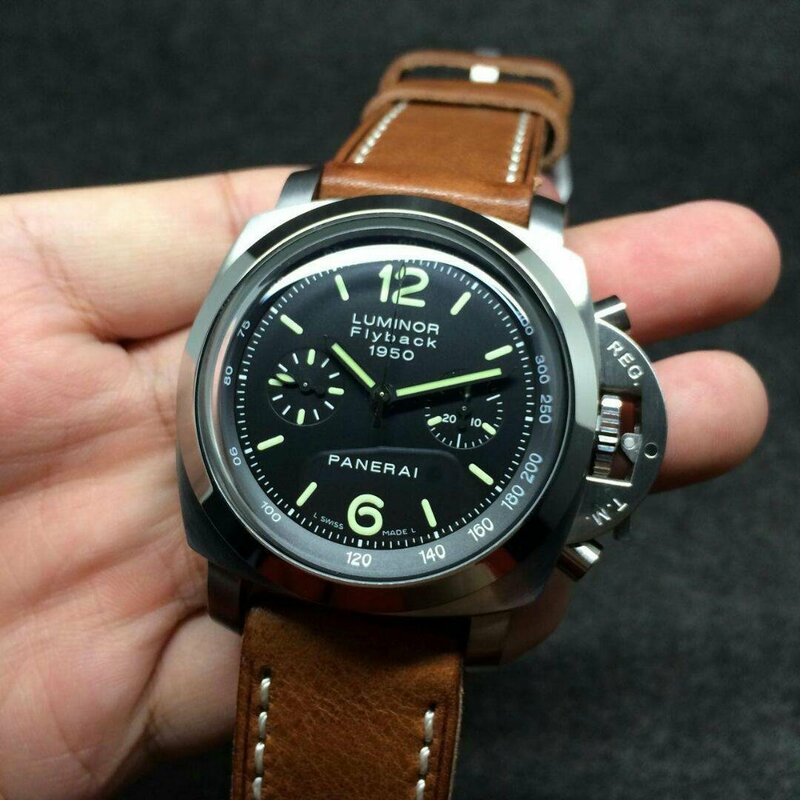 It is PAM 212. 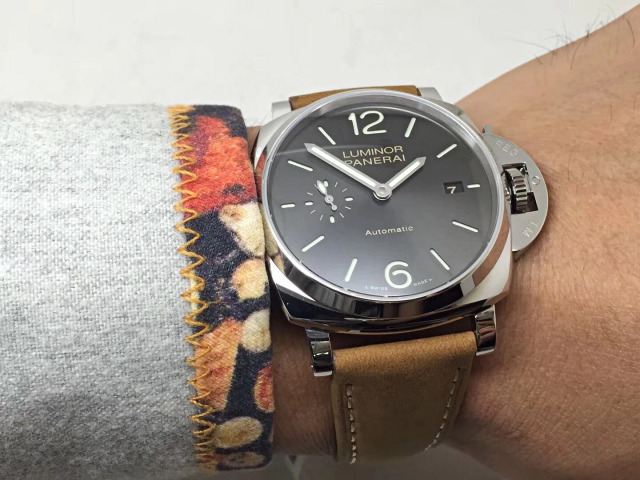 I seldom have a favor in Panerai chrono watches because these simple PAMs like PAM 111, 005 and 441 are my favorites. 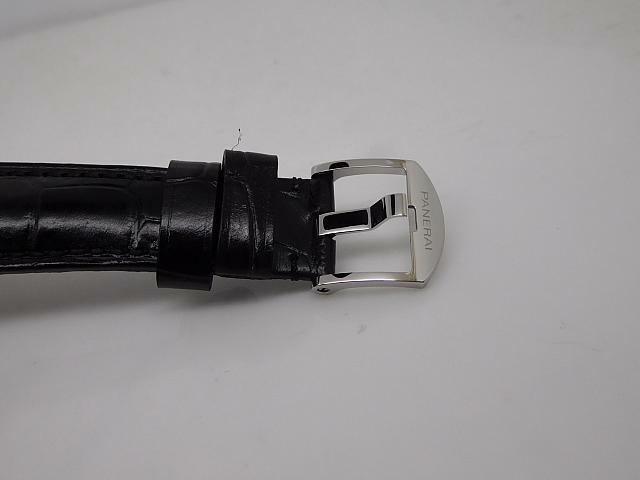 But this does not mean this replica is not well made. 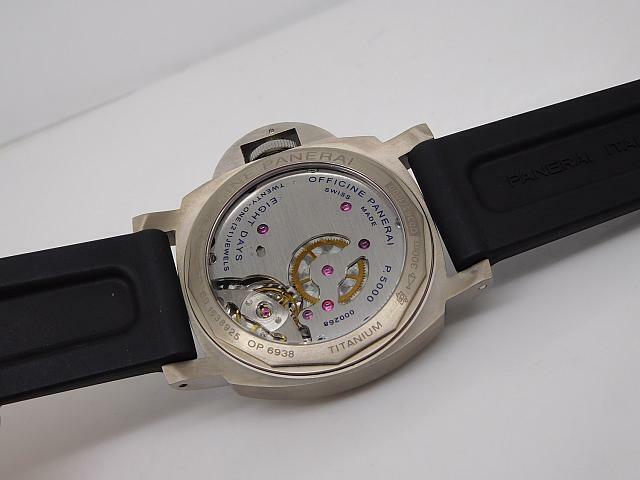 Noob factory recently made this replica, genuine watch has real flyback function, however in appearance, this fake PAM 212 looks completely 100% the same as real watch. 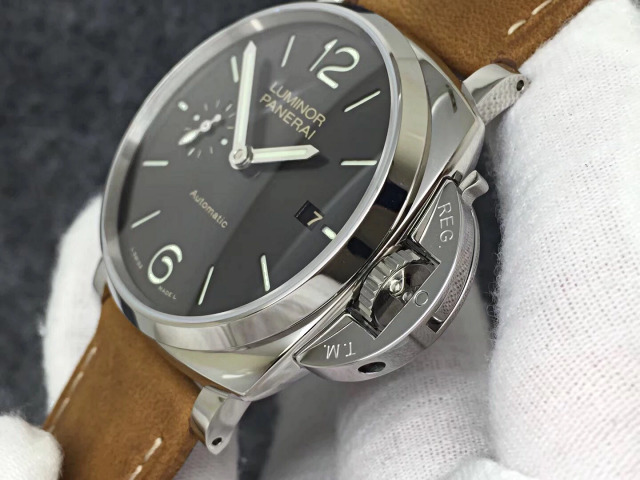 Panerai is considered to be a tough military watch brand, like this PAM 212, although with chronograph function, the case and band design always bring you back to the era of military submarine. 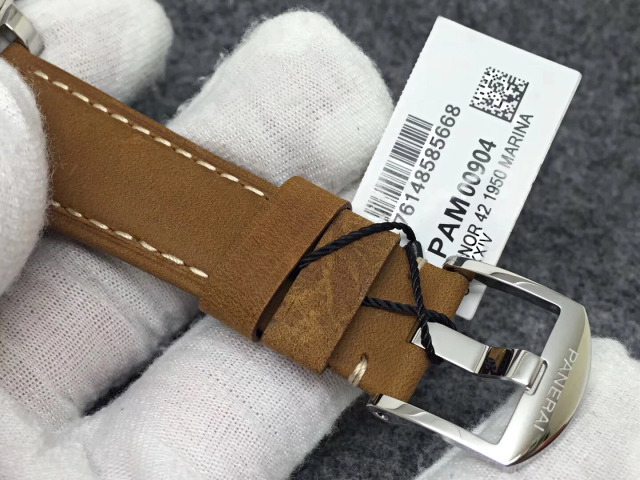 I like the way factory uses in case finishing, brushing plus polishing. 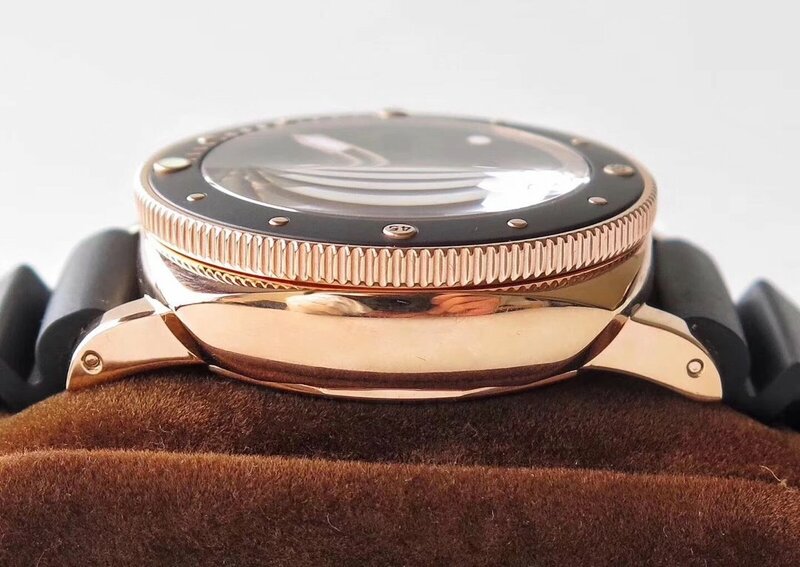 The case is evenly brushed while the bezel is polished smoothly. 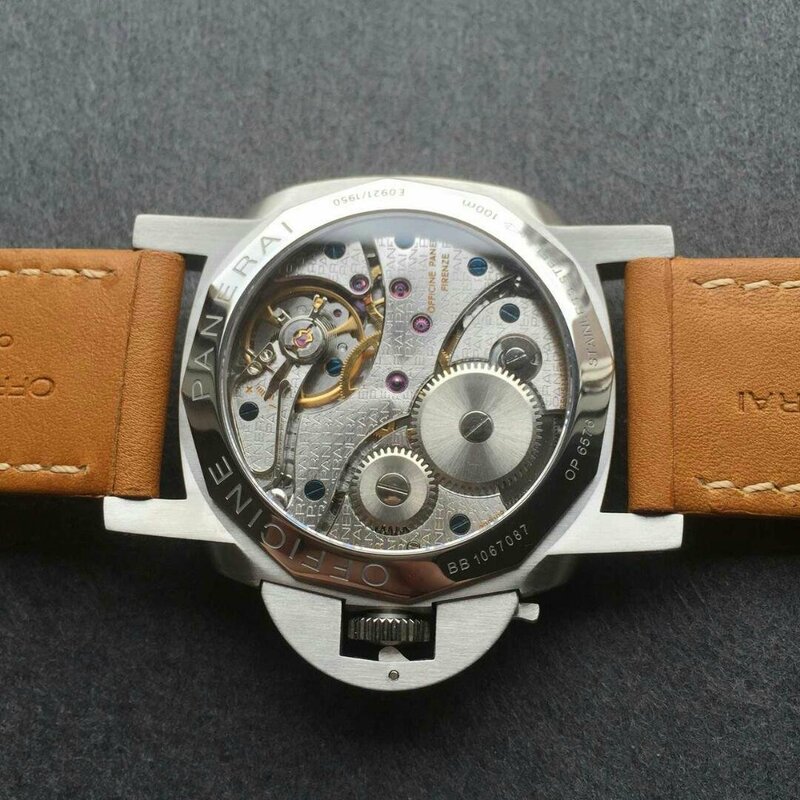 Crown bridge is the mostly used place of a PAM, so this watch part must be processed well to avoid scratches. 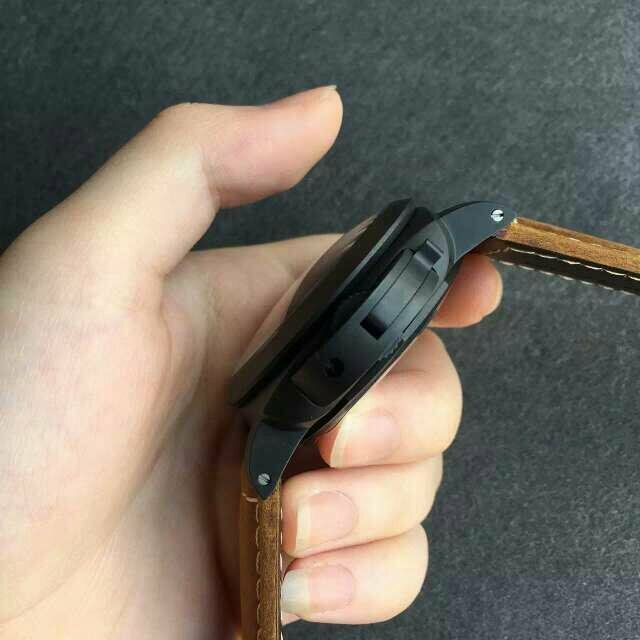 The case is well construsted to form like one piece so that the watch will have a great water resistance. 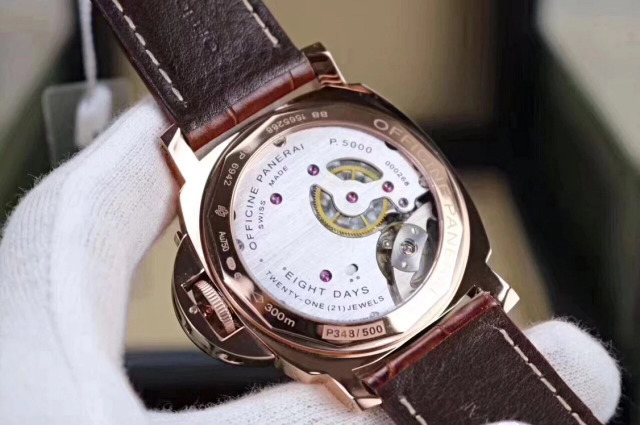 The crystal is domed sapphire, which takes a watch master more time to complete such a domed crystal than a flat one. 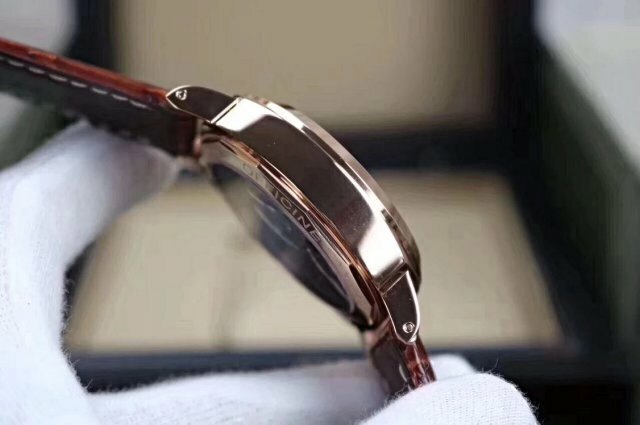 This sapphire crystal not only has a high scratch resistance, it also has a good transparence and clerance because of anti-reflective coating on the crystal. 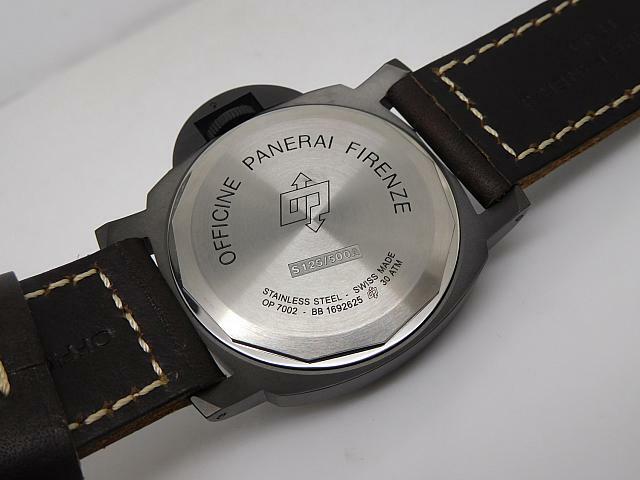 So the dial is clearly readable, it seems there is no crystal under sun light. 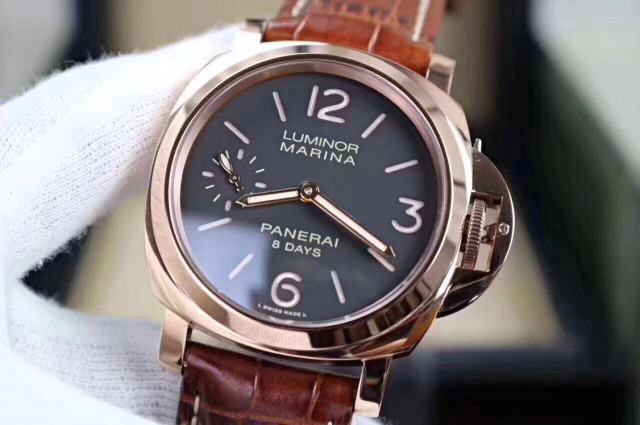 On the black dial, all hour markers and hands are applied luminous material, which looks a little patina. 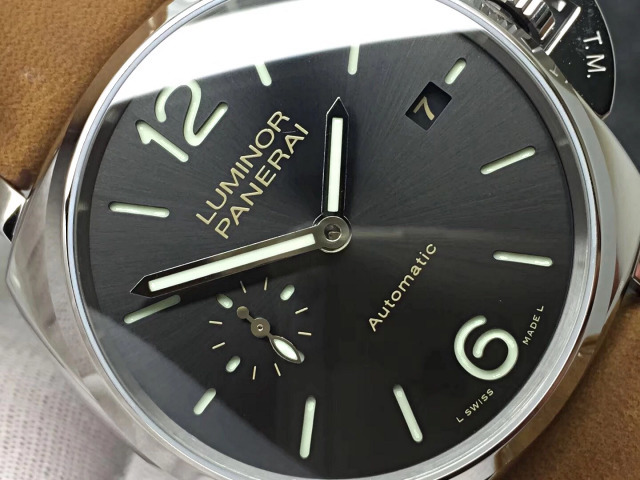 Big “6” and “12” markers make you more concentrated on the dial when reading time. 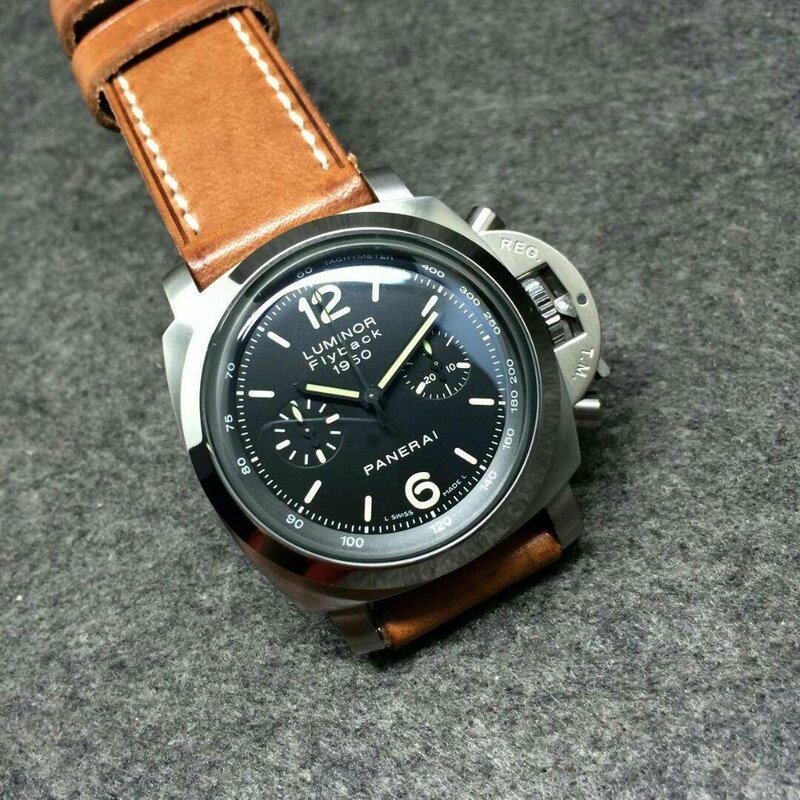 A small dial positioned at 9 o’clock is for small seconds display, while the subdial at 6 is a 30-minute chronograph counter. 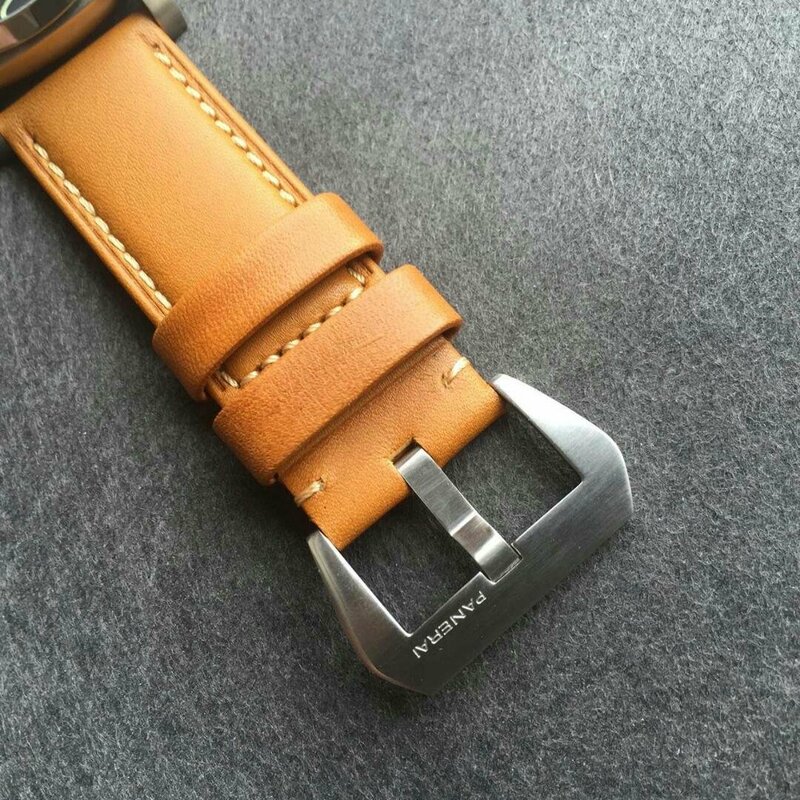 Besides nato strap used on some Submariners, this leather band is my favorite. 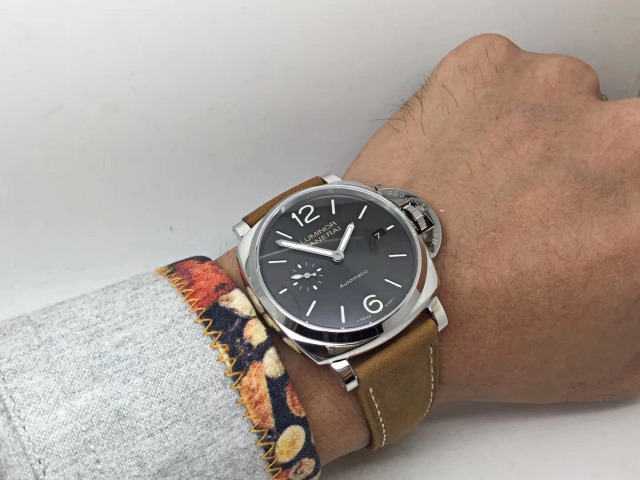 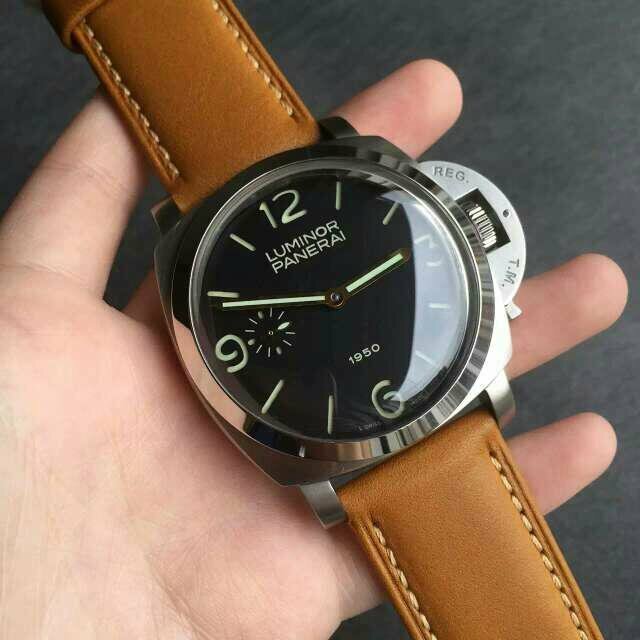 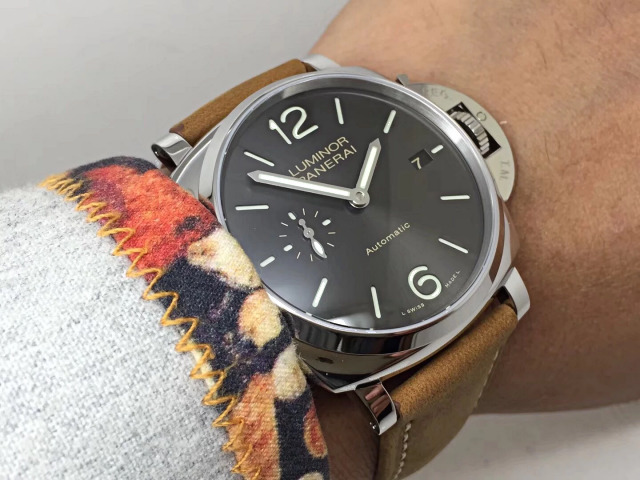 It is not hard like some people said, it is soft and most important the leather band looks tough, which exactly meets the military watch style of Panerai. 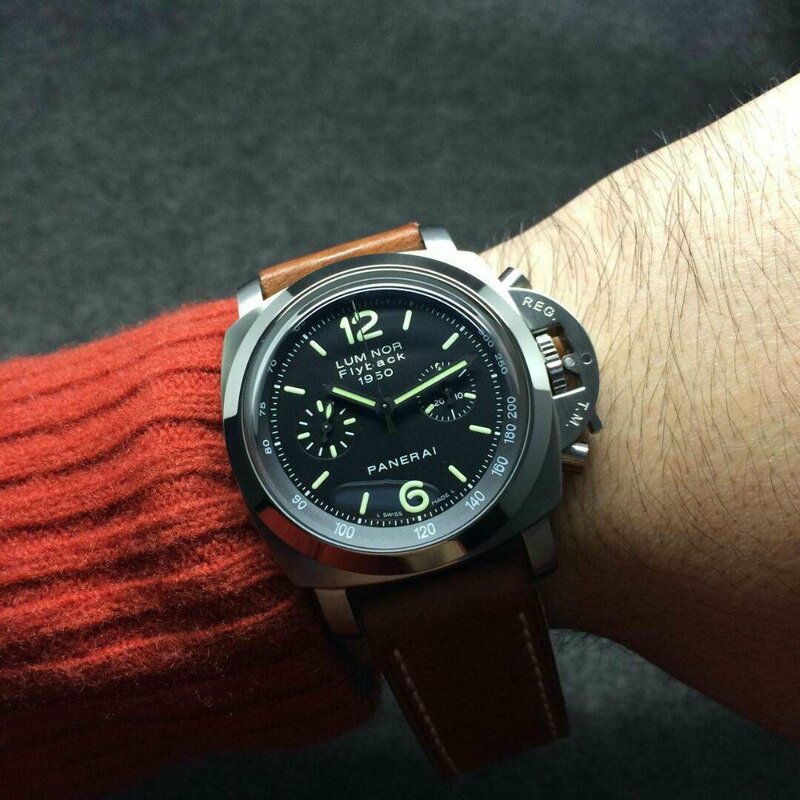 PAM 212 features such a thick band with a little aged finish, it is absolutely a good watch for tough guys. 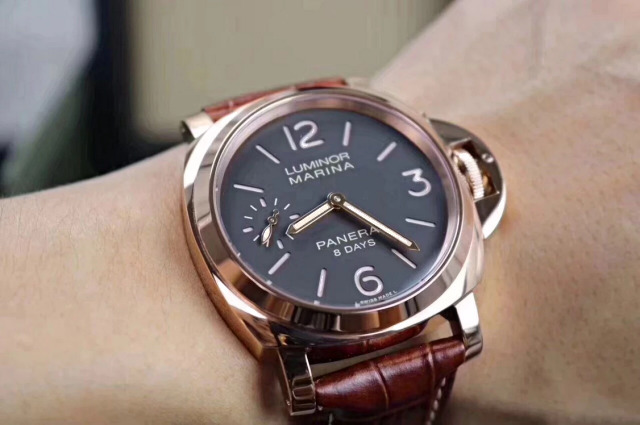 And sometimes I think a PAM also looks good on a girl’s wrist. 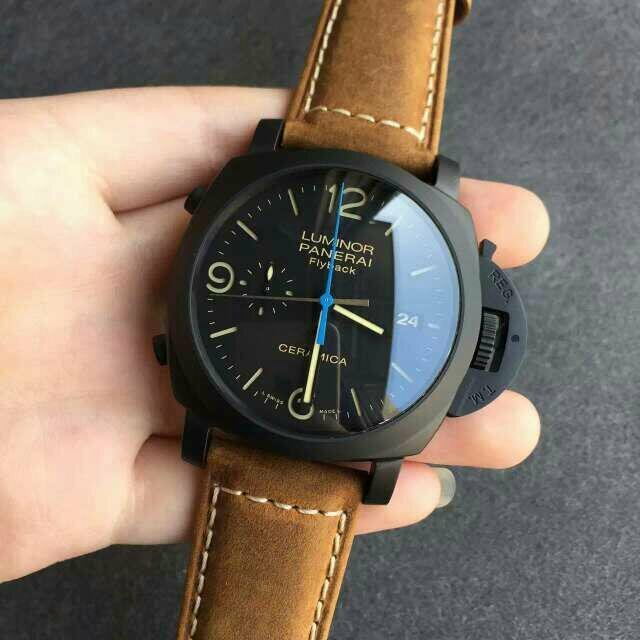 What’s your opinion? 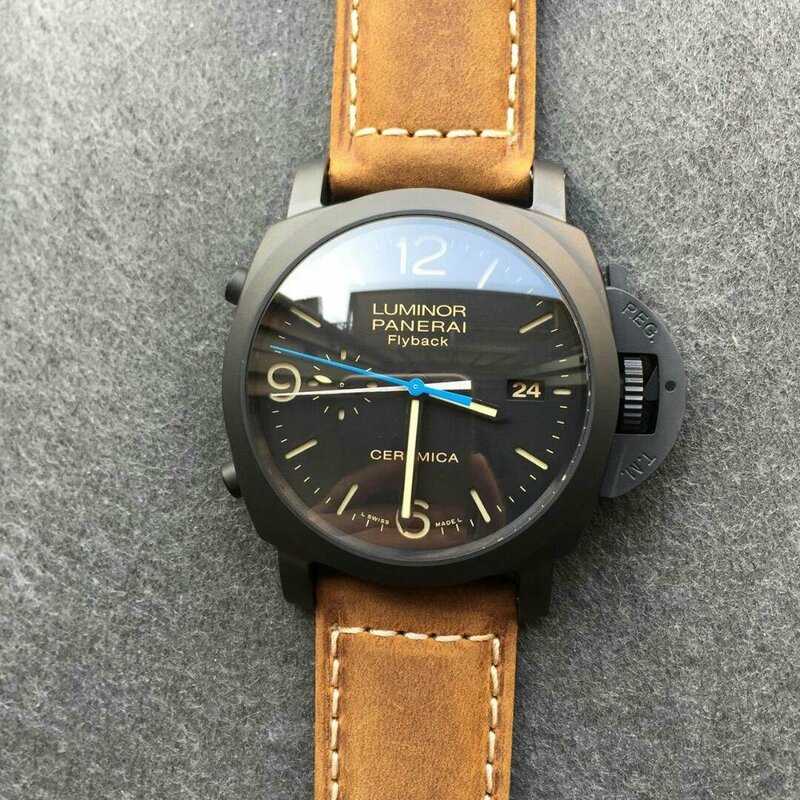 Long time not to post reviews here. 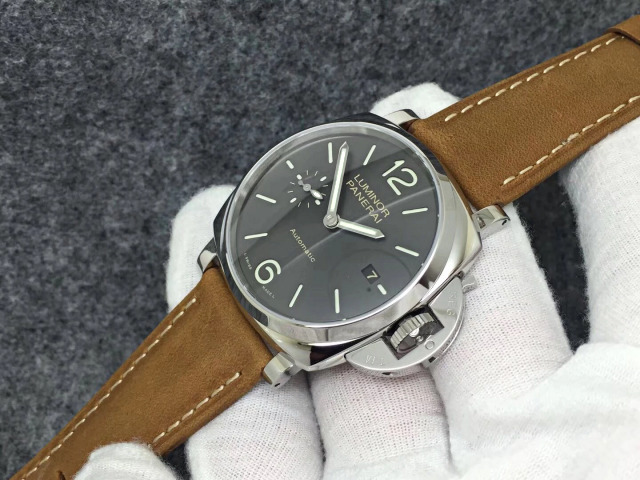 I have a lot of work to do each day in a watch factory here in China. 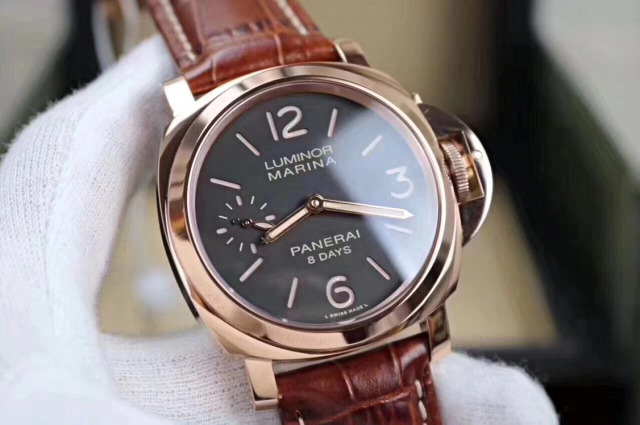 Every day I saw lots of people all around the world came to this biggest replica watch market to buy watches, absolutely most of those watches they bought are cheap quartz replicas, there will be one thing appeared in my mind, do they really love watches? 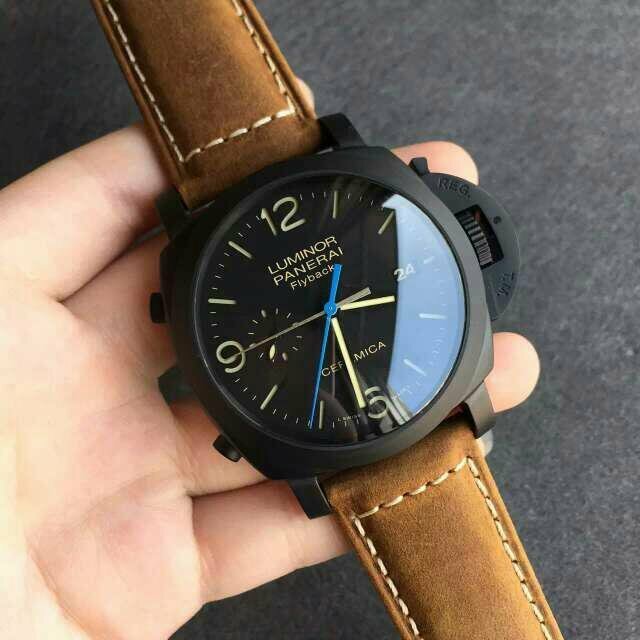 I mean replicas. 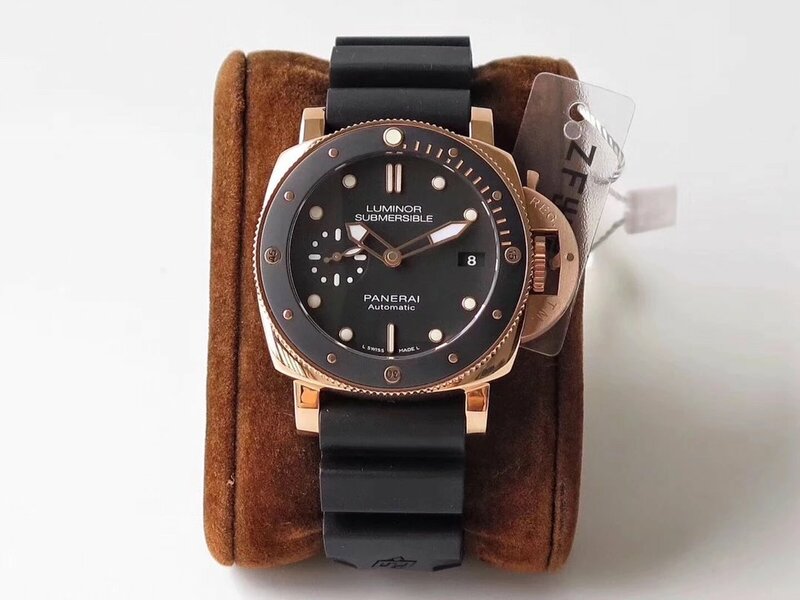 They really do not need to spend their hard-earned money on those cheap knock offs, just take a little further step, they could get a high end 1:1 replica watch that will last very long. 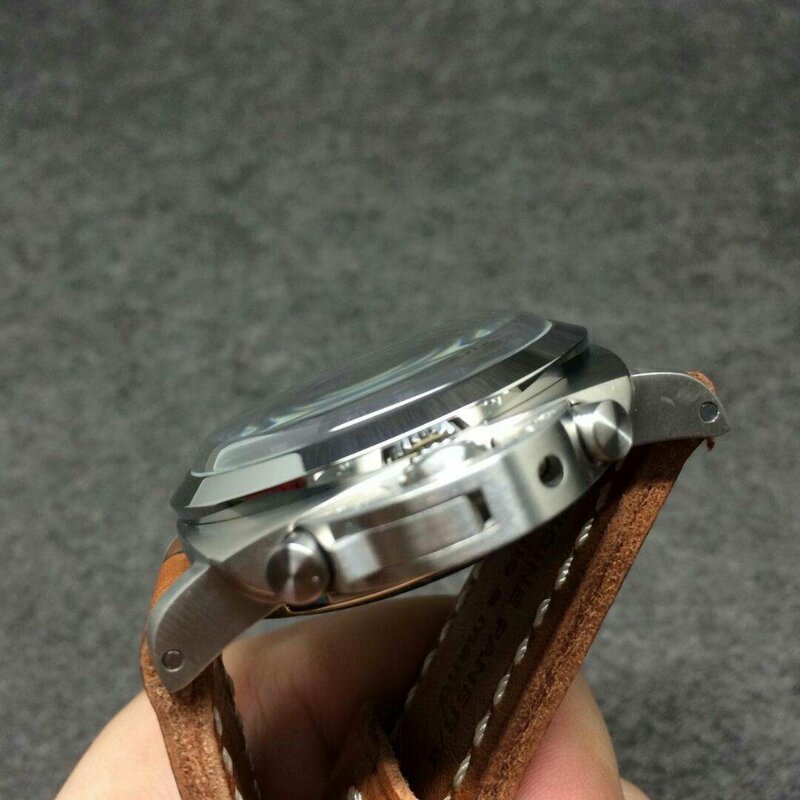 Or they do not know where to buy a real 1:1 swiss replica watch? 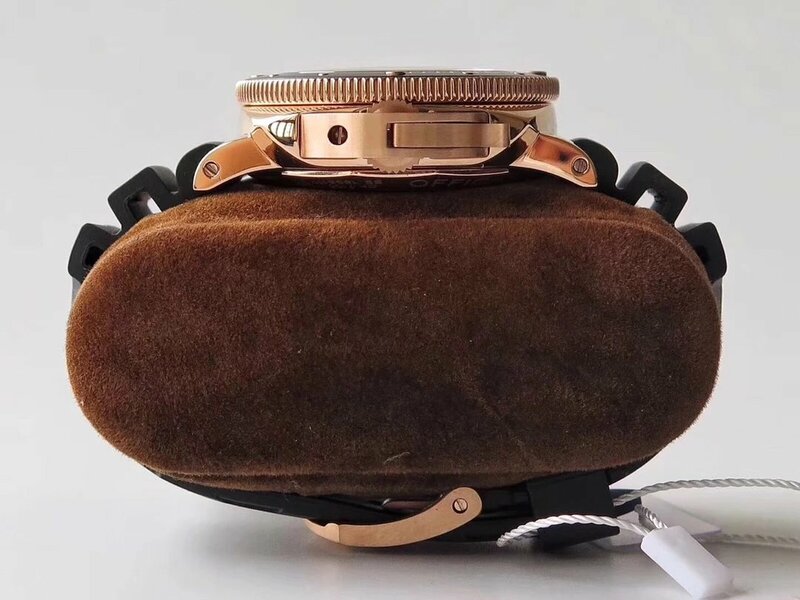 I guess so. 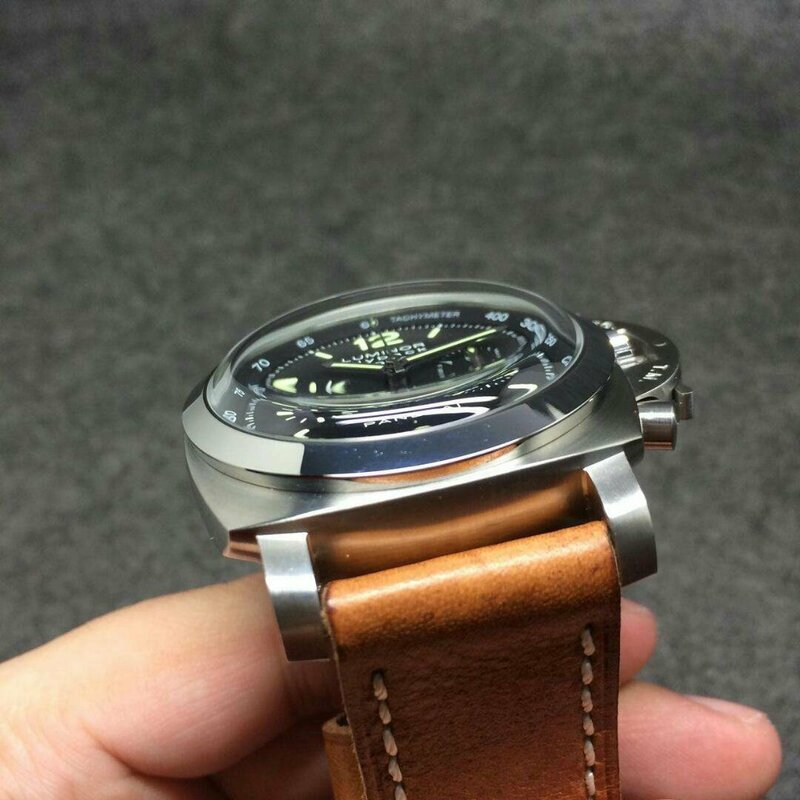 Here I opened this blog, to help you guys get the best replicas in our market. 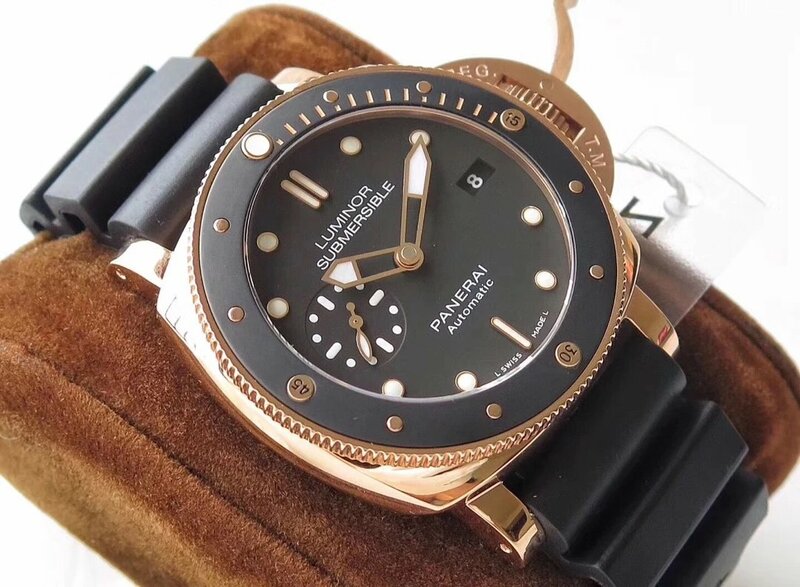 Because I have a direct contact with those famous factories like Noob, BP, ZF, V6, etc, those factories, you may already know, and I also mentioned them on my blog posts, they produce the most high end replicas of Rolex, Panerai, Hublot and other Swiss brands. 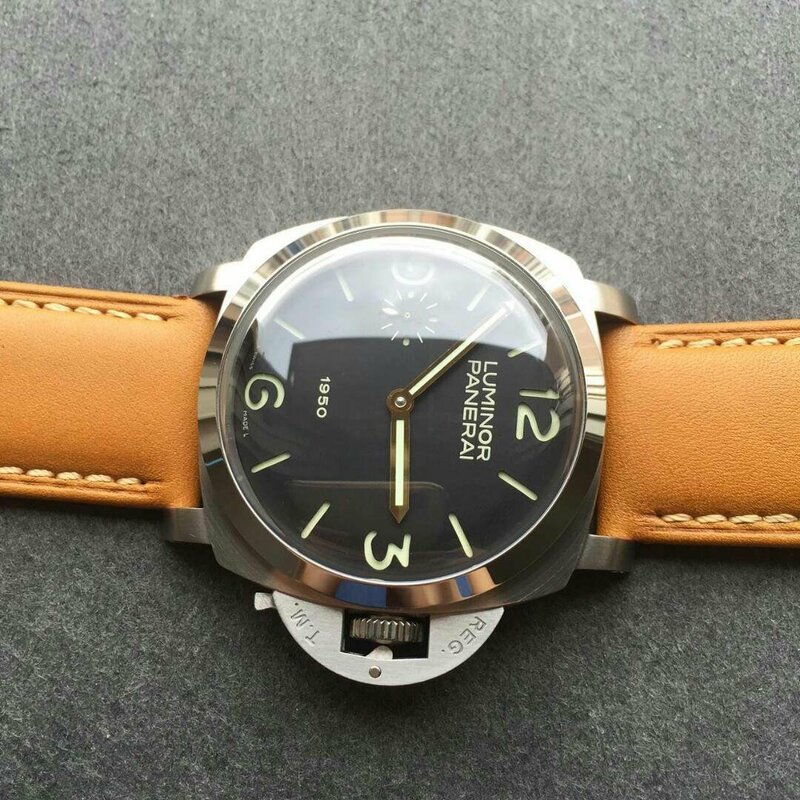 Through this blog, I will tell them which watch you want and get you the most reasonable price. 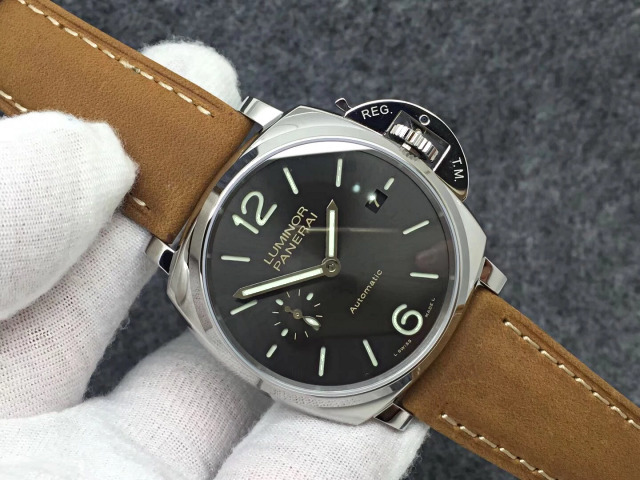 Today, the watch I want to give a review is another vintage Panerai. 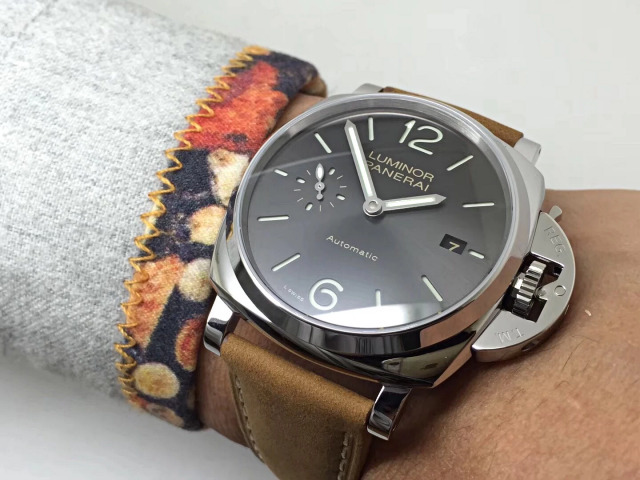 It is Radiomir 1940 California PAM 718. 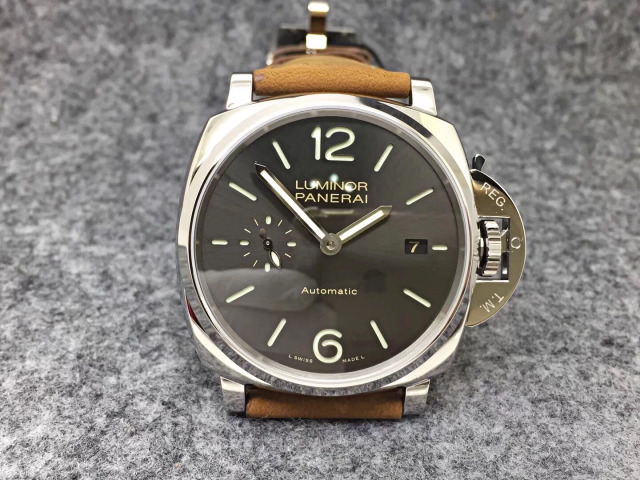 I said it is a vintage PAM because its dial uses the old California style that could be only found on old Panerai watches. 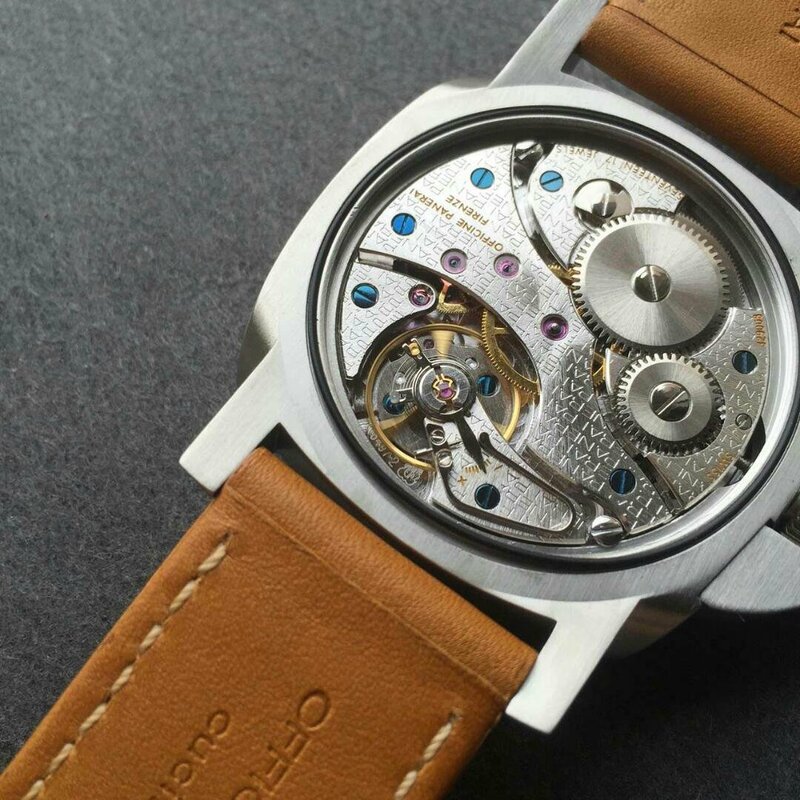 Blue hands with track minutes scales. 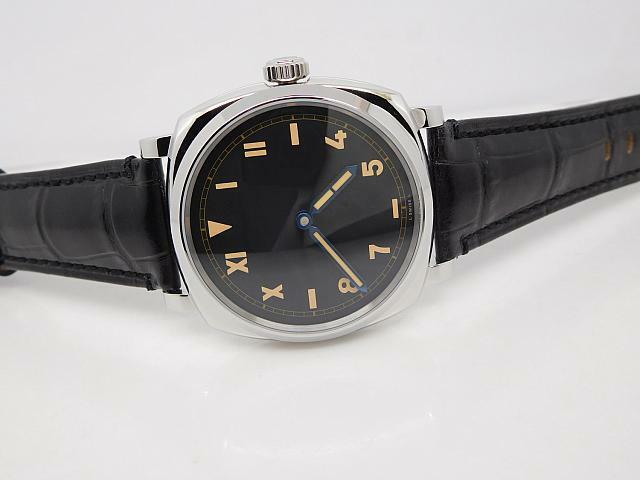 The replica uses traditional Radiomir case that is measured to be 42mm in diameter. 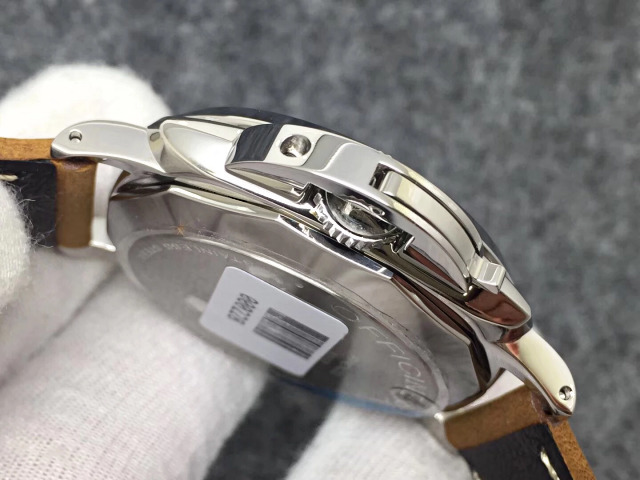 The case is made of 316L stainless steel and polished like a mirror, round bezel feels smooth and the lugs perfectly integrated into the case, it is a molded one-forged case piece and V6 factory watch masters have spent a lot of efforts on case finishing. 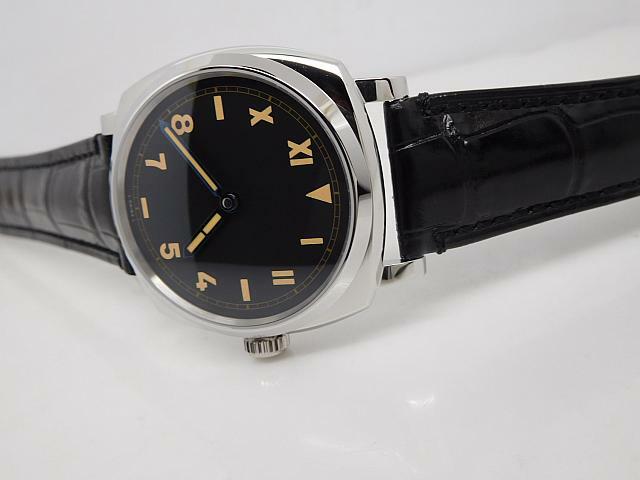 Classic California unsigned dial in black color, hour markers are mixture of various characters. 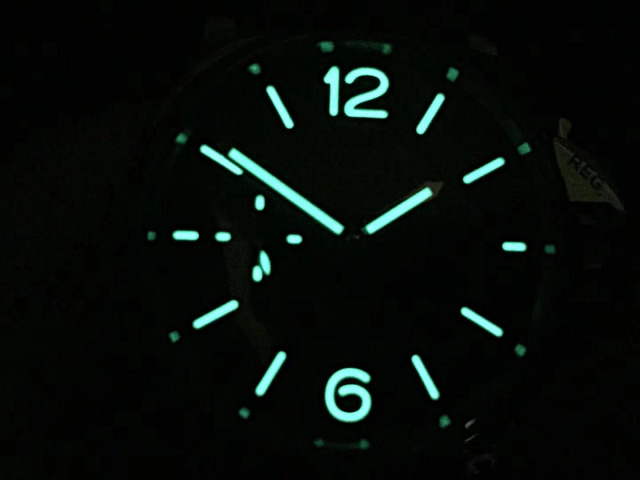 Only two hands in blue displaying hours and minutes, hands and hour markers will emit strong green light in the dark. 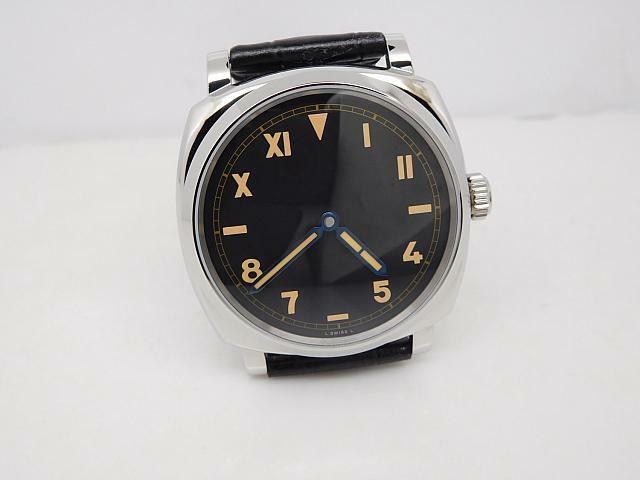 No more other printings could be found on this special dial except “L SWISS L”. 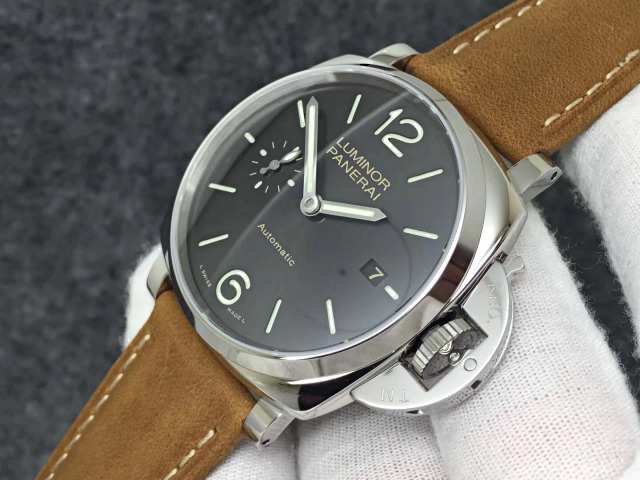 The replica Panerai PAM 718 is powered by a clone P.1000 movement. 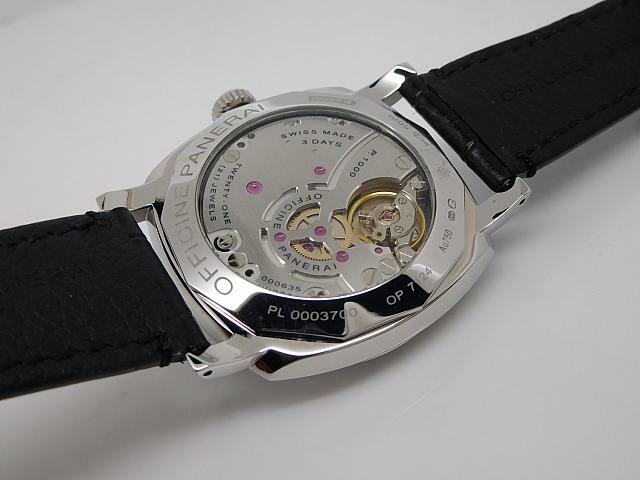 Actually the factory uses a Chinese manual winding movement to modify, so the movement plates on the replica will have the same decoration and marking as genuine P.1000 Caliber. 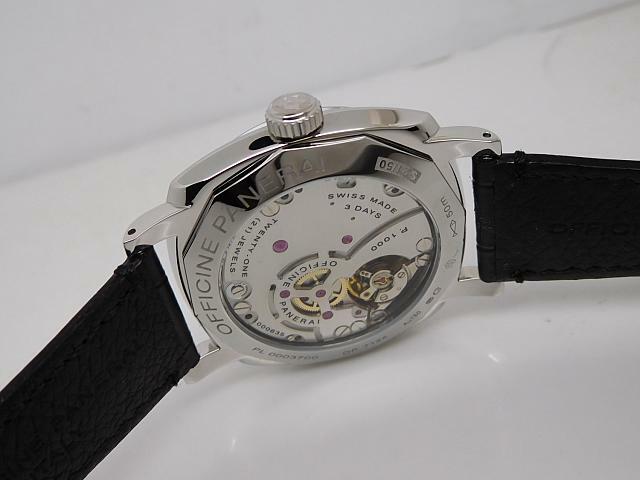 The biggest difference is that genuine P.1000 Caliber has 3-day power reserve once it is fully wound. 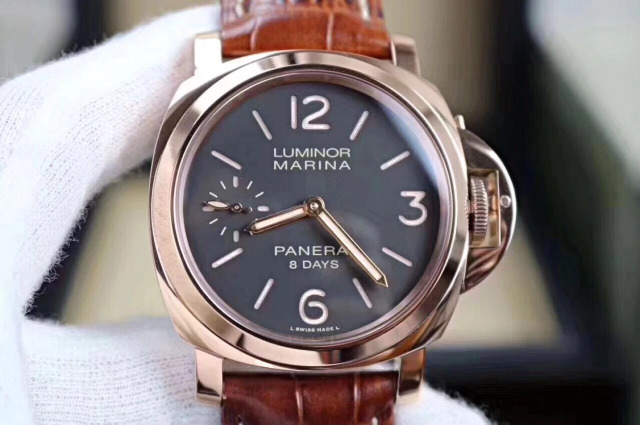 The movement is shown through a crystal case back, so, do not show the watch through its movement in front of somebody who is a Panerai watch expert, or he will identify it as a fake easily although the dial and other details are so real. 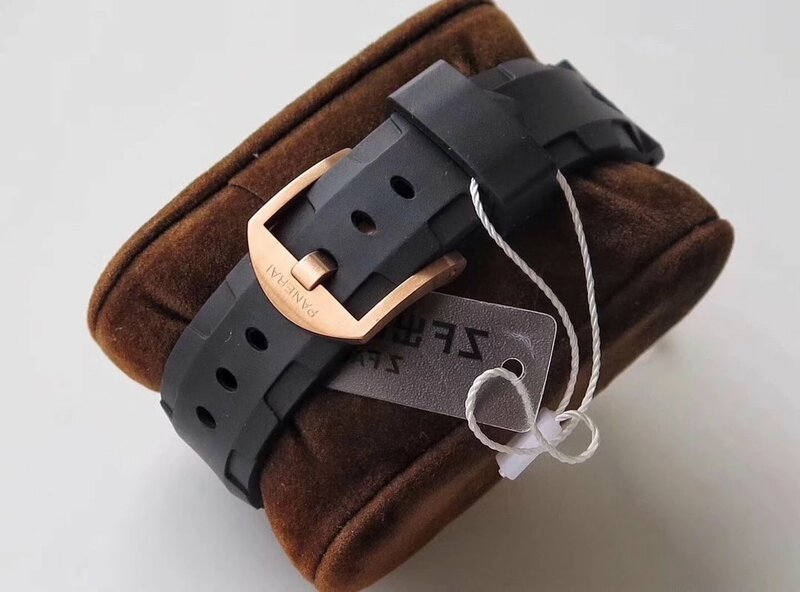 Genuine black leather strap features black hand stitching, strap has genuine like texture and it is indeed made of calf leather, very comfortable to wear.